We arrived at the Maihama stop of the JR East Railway station (note: we came in from Tokyo Station, after taking the bullet train from Kyoto. 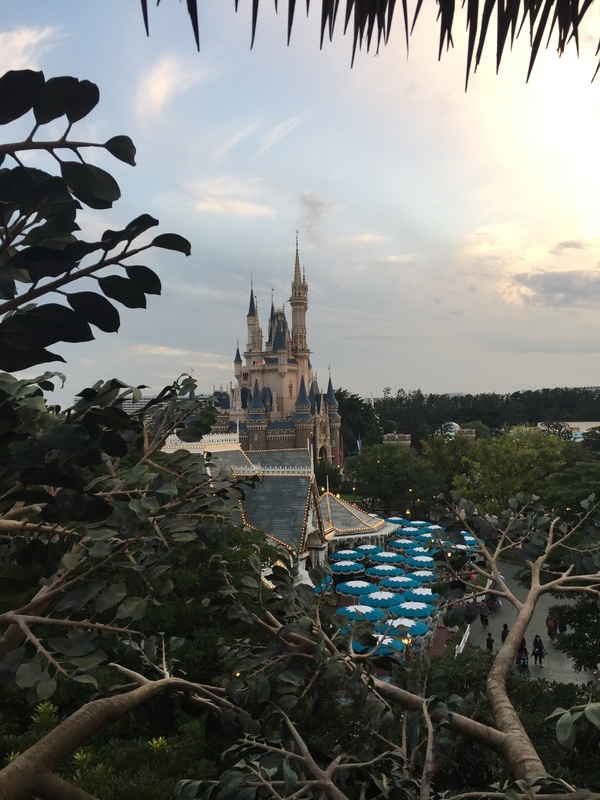 We’d been in Japan two weeks already so we were railway pros).The Maihama stop is where you get off for Tokyo’s equivalent of Downtown Disney and Disney’s Ambassador Hotel. 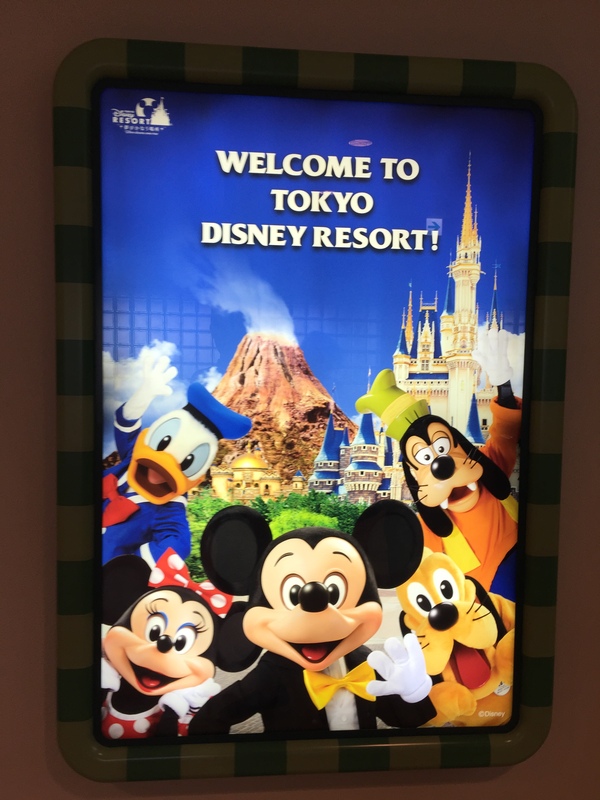 After you get off the train, you’re within a five-minute walk of both the Tokyo Disney Welcome Center and the Monorail. We skipped the Welcome Center, but I’m told you can check in there and have your bags delivered directly to your hotel. 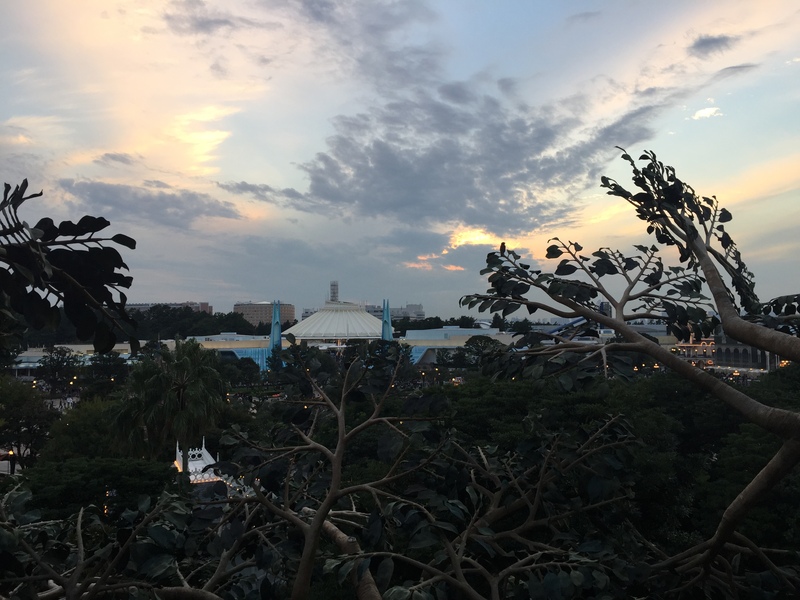 Instead, we bought two tickets to the Disney Monorail (whose ticket machines were clearly the same system as the standard railway) and hopped on board. 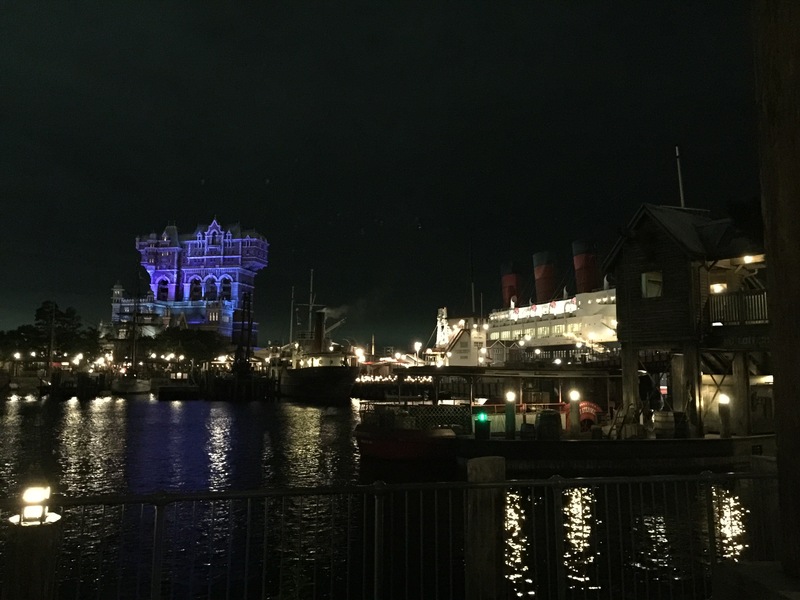 By this point, I’m giddy- taking pictures of everything around me and the incoming monorail when it arrives. 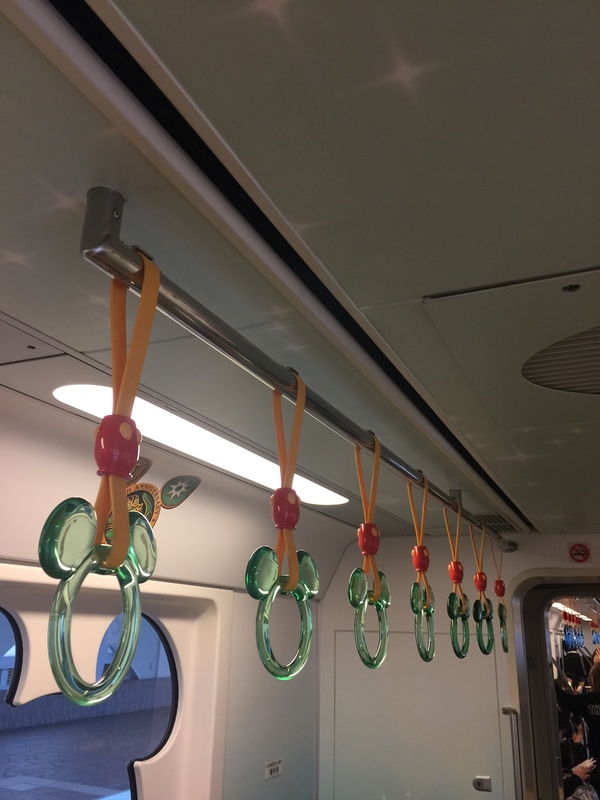 We hop on and immediately notice that the small hand holding things that dangle from the ceiling are shaped like Mickey. 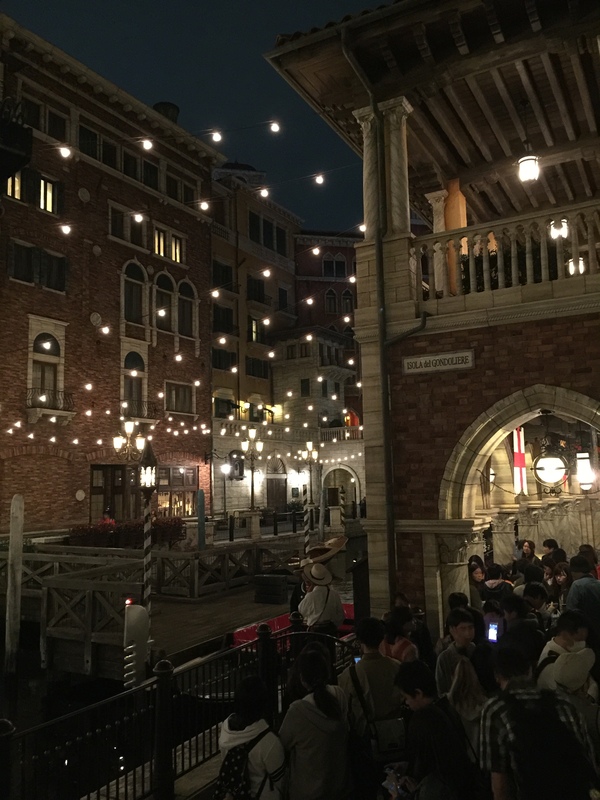 This would be the first, but most definitely not the last time, I’d be impressed with Tokyo Disney’s commitment to the details. The monorail loop has four stops and we started at the Resort Center stop. 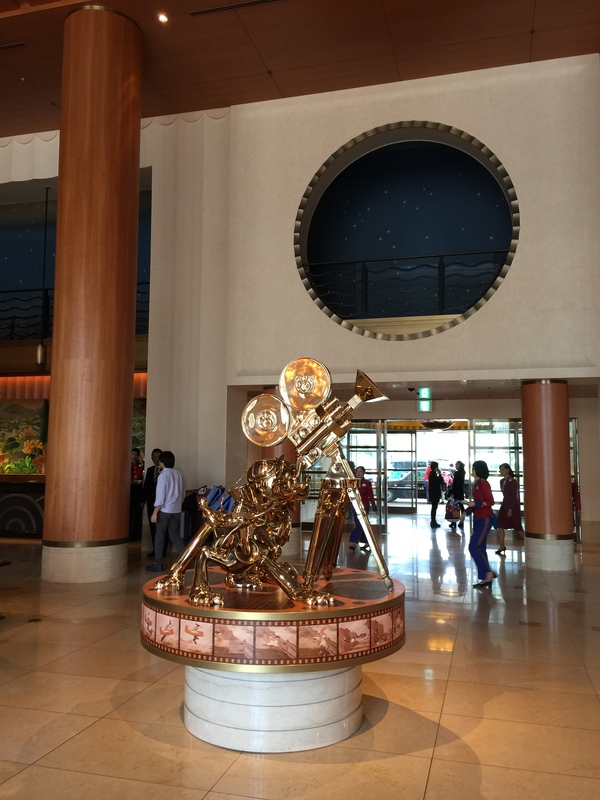 The next stop was Tokyo Disneyland and the Tokyo Disneyland hotel, the 2nd stop was for non-Disney resort hotels (Hilton, Sheraton, etc. 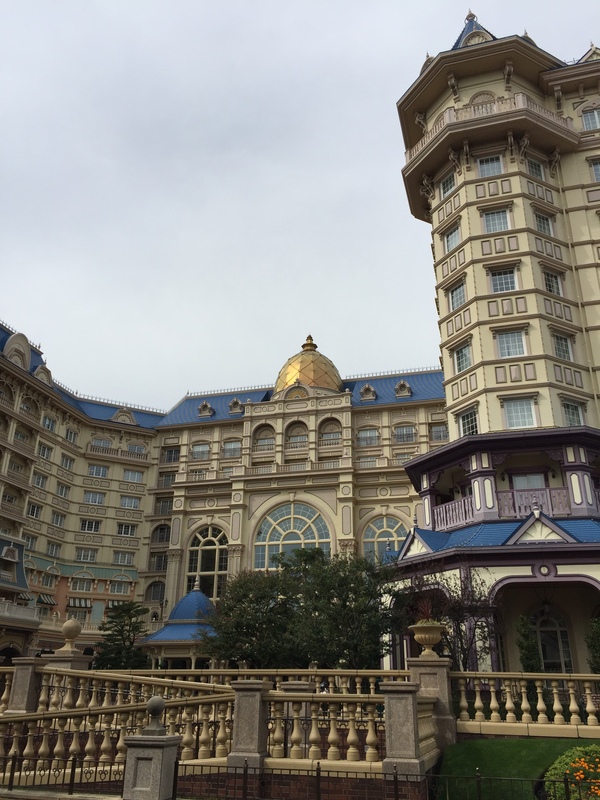 ), and the 3rd stop was for Tokyo Disney Sea and the Hotel MiraCosta which is where we were staying. The entire loop takes about 8-10 minutes and it gives you some great views of the hotels and the parks. 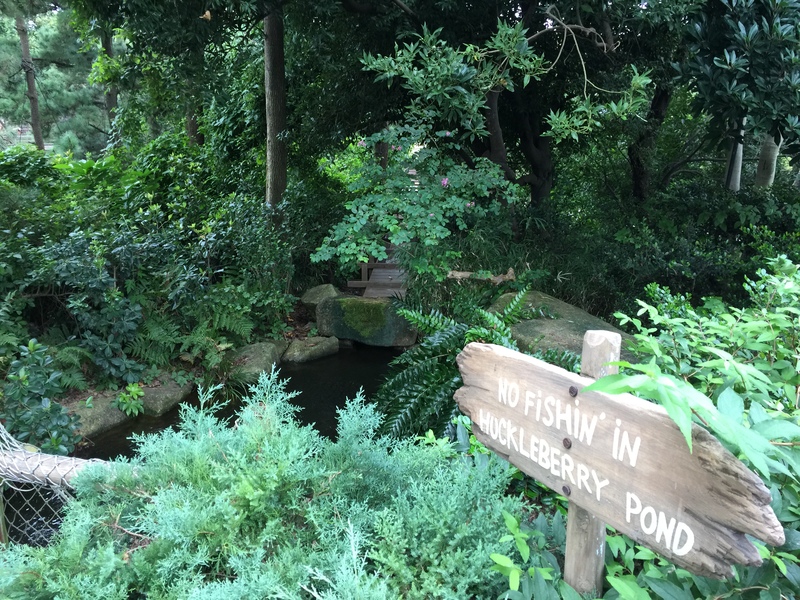 For more information on the monorail loop, click here. 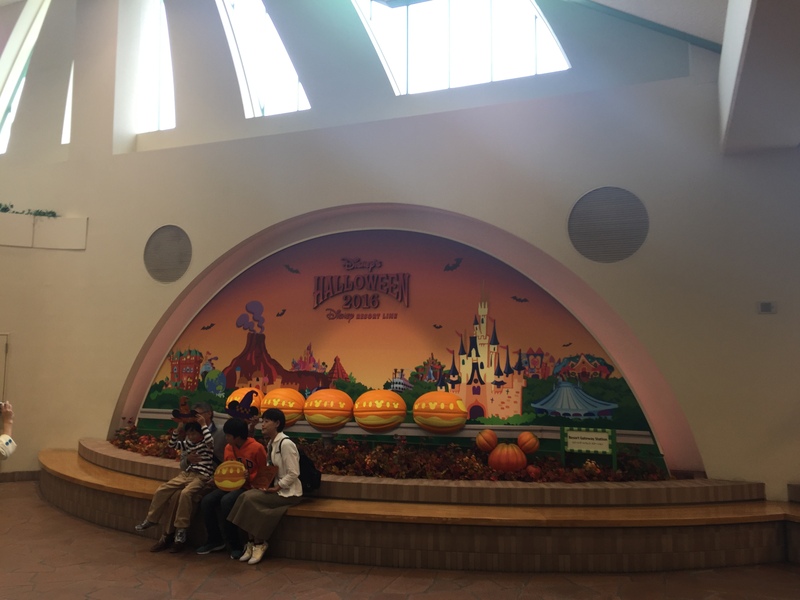 TIP: Tokyo Disney’s new Celebration Hotel is not on the monorail loop because it isn’t on property. It’s a few miles away, and provides bus service to and from the resort area. 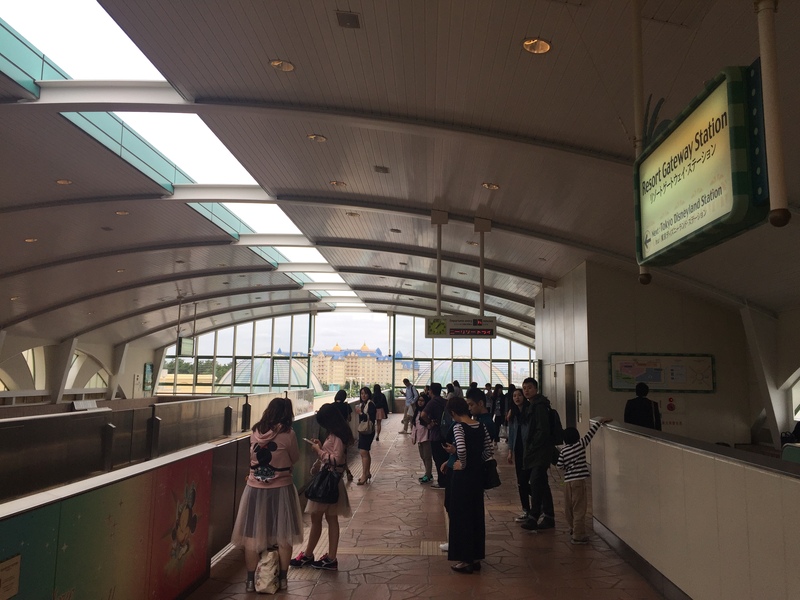 We disembarked the monorail at the Disney Sea stop and there was a private exit for Hotel MiraCosta guests (the exits location is towards where the front of the train is). 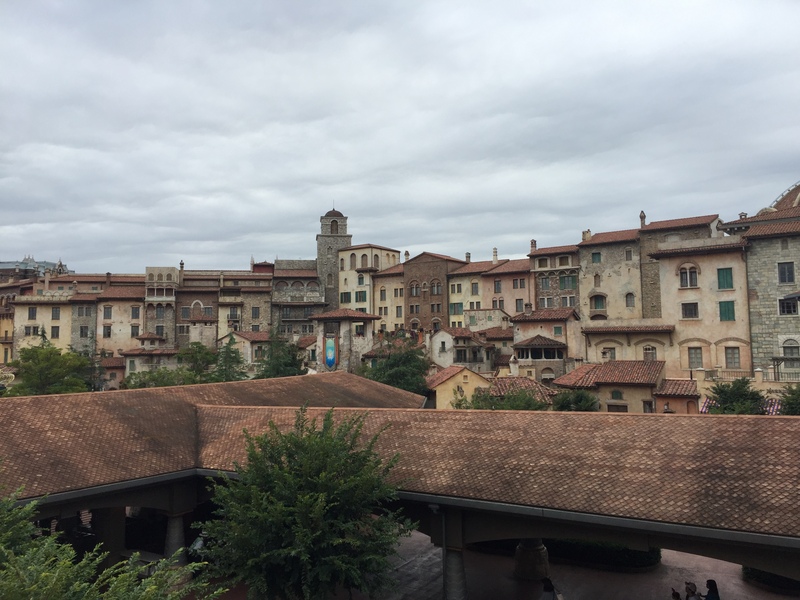 We walked down some stairs and along an elevated walkway and we had our first view of the hotel- it was awesome! My giddiness continued. 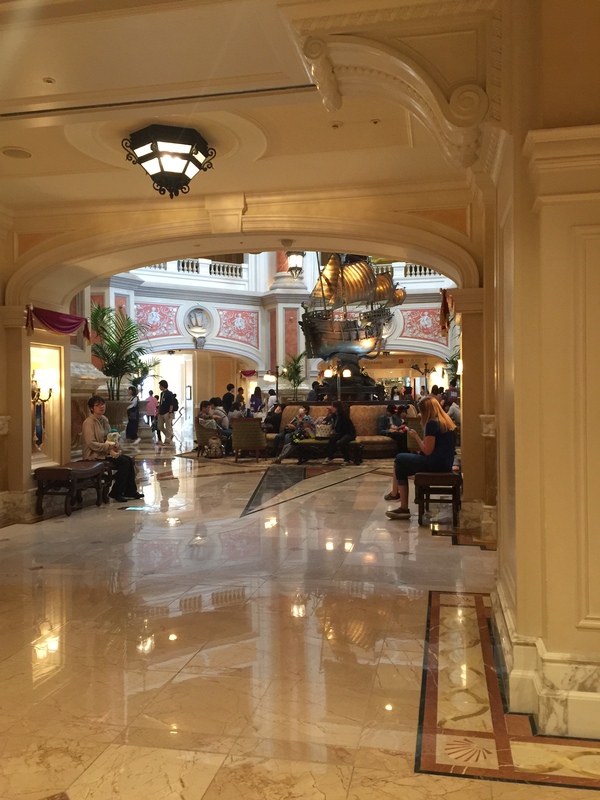 After a few minutes, we arrived at the front desk and we began to check in. It was a bit early, maybe 1 PM, but I was hoping they’d have our room ready and much to my surprise they did. The check-in process took about 10-15 minutes, and the receptionist spoke good-enough English. My wife and I are not high maintenance and often just take our own bags to our rooms, but they insisted that we stand by our bags and wait for a bell clerk to assist us to our room. We obliged and sat in the lobby for about five minutes and the bell clerk escorted us to our room. 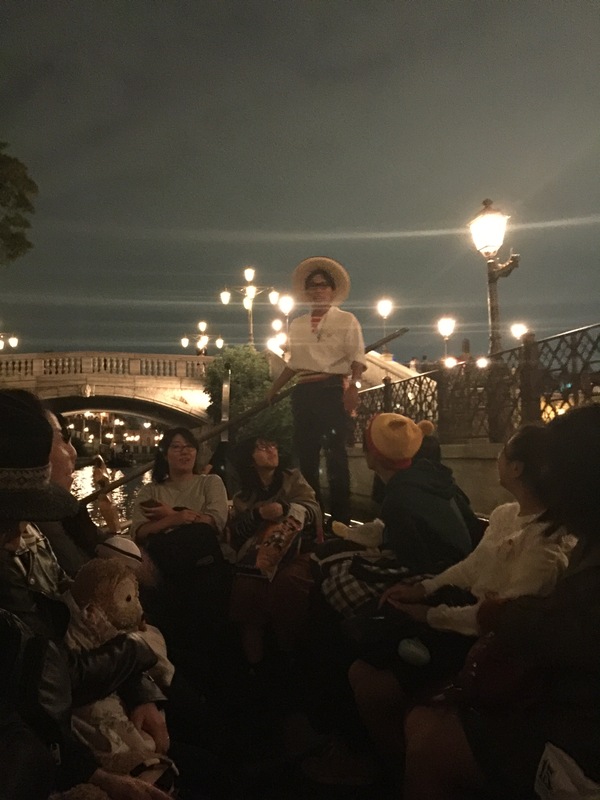 He was super friendly, spoke good English, and in general just seemed happy to be there helping us- another common theme in Tokyo and especially at Tokyo Disney. We got to our room and I was very happy because we landed a corner room on the Porto Paradisso side with a Double bed. This may sound easy to do, but I had to book as far in advance as is possible because there aren’t a lot of rooms with this view and a Double bed. TIP: If you’re looking for a big bed in Japan, the term you’re looking for is ‘Double Bed’. In Japan, it’s more like a queen-sized bed. 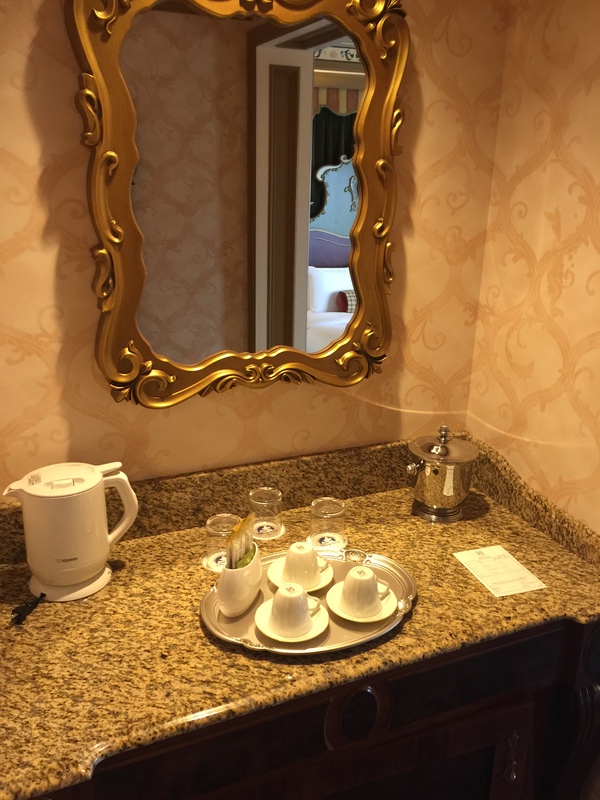 Our corner room had a view of the harbor and Mount Vesuvius as well as the Venetian Canals on the other side. We could watch all the shows from our room which was great. 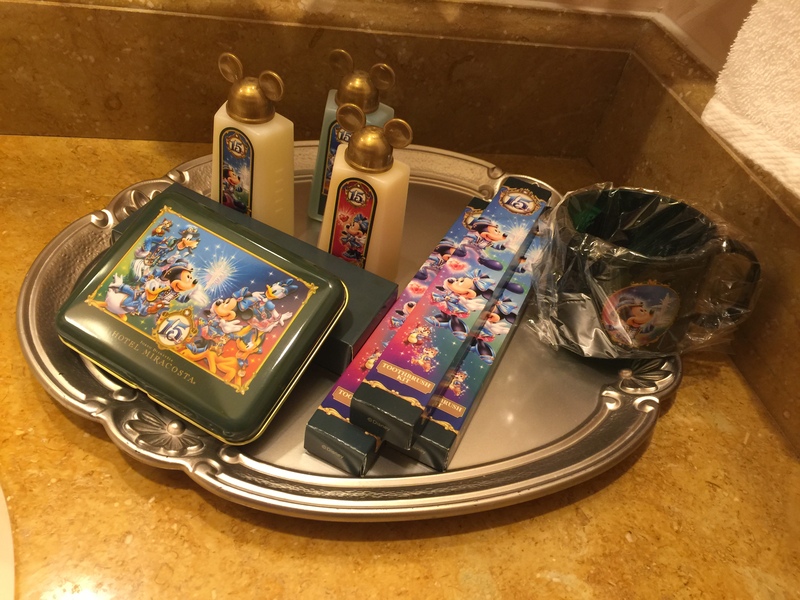 The bathroom was broken up into three areas: the vanity area with the sink and toiletries which were adorable and all had DisneySea 15th anniversary branding. Next, the toilet room which was small and to the right. 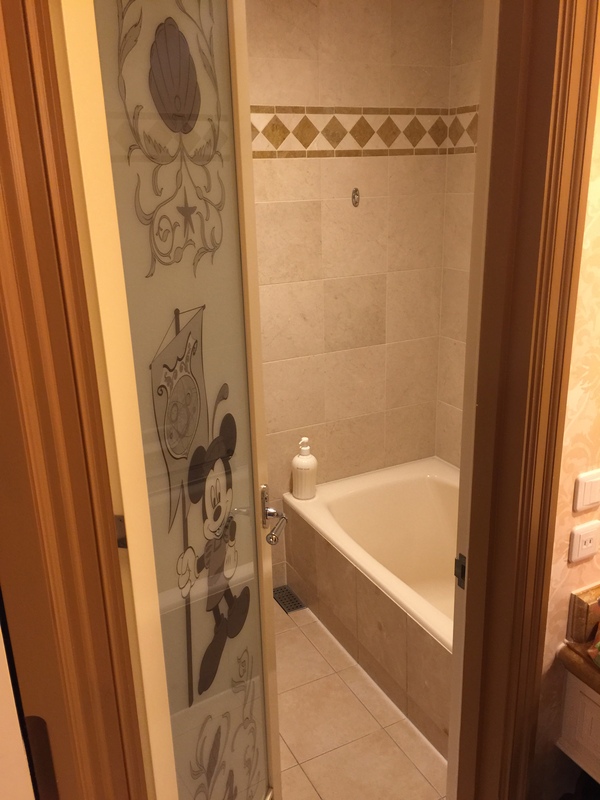 And to the left, the shower room which was literally it’s own little room with a walk-in shower and a bath tub on the side. I loved that shower. 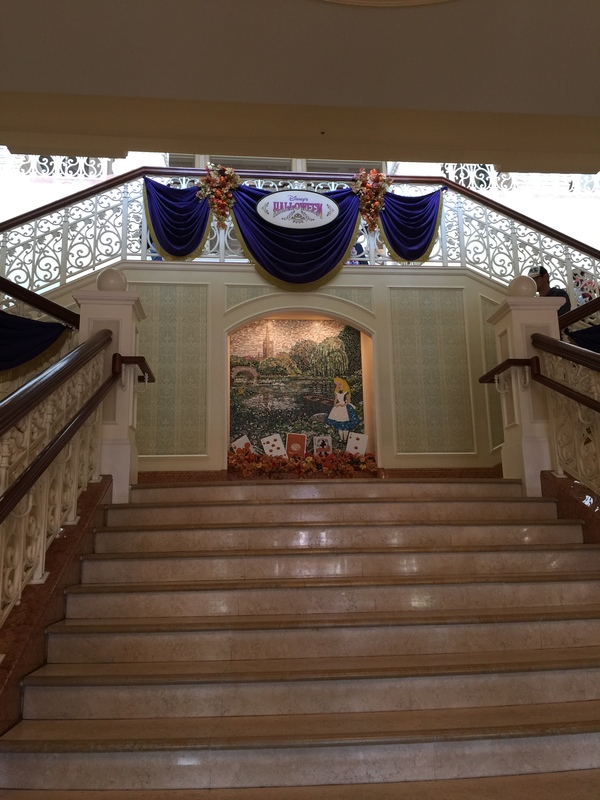 We relaxed in the room for a bit, but the excitement got the better of me and soon we were headed down to the lobby to buy tickets for the parks. You can buy them at a small counter near the lobby, so we got ourselves four-day park hopper passes. I believe this is the most days you can buy for a single ticket, and I’d say that’s plenty. 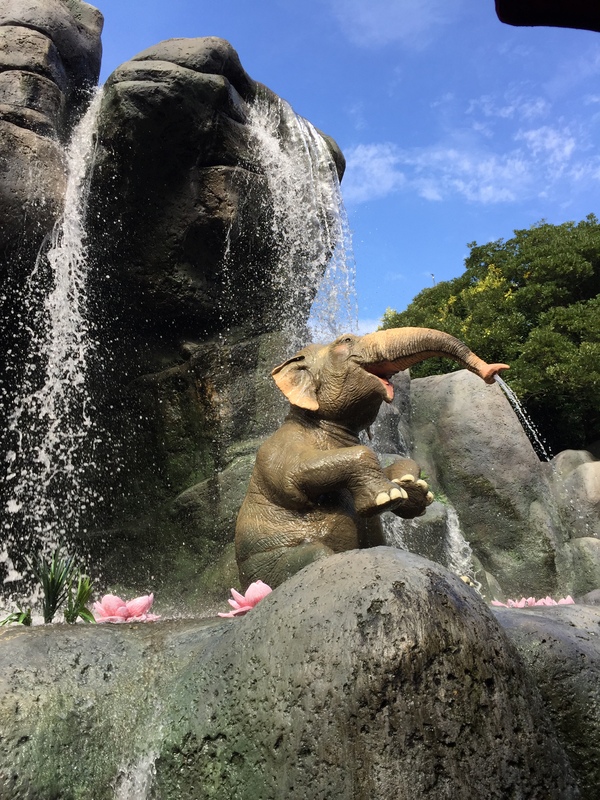 In fact, you can probably see everything in the parks in two days, but given it was our first time and who knows when I’ll be back, I wanted to soak it all in a bit more leisurely. 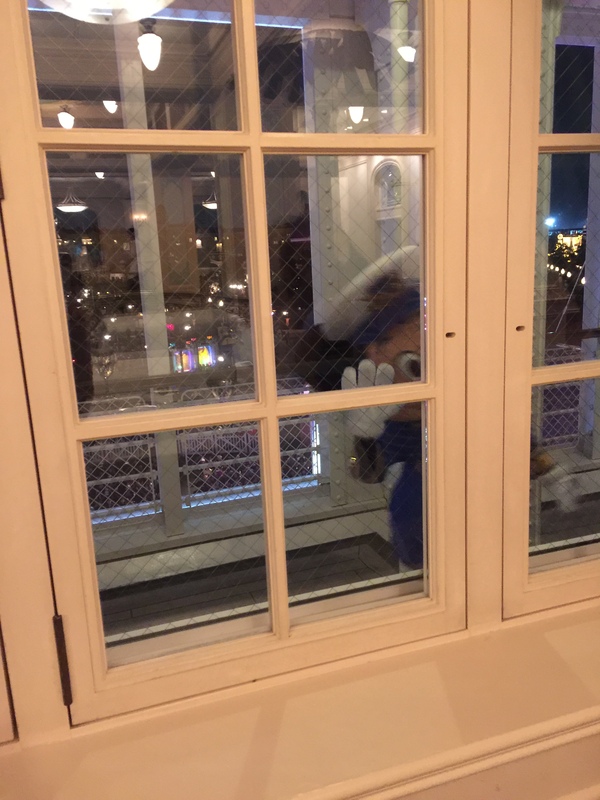 Tickets in hand, we took the elevator down one more floor to the Disney Sea private entrance for MiraCosta guests. This would prove hugely helpful throughout our stay, as for at least one of the parks we didn’t have to tangle with the monorail (which is easy, don’t get me wrong, but best case it’s a five minute walk, five minute wait, five minute ride, which is 15 minutes I’d rather spend in the parks). 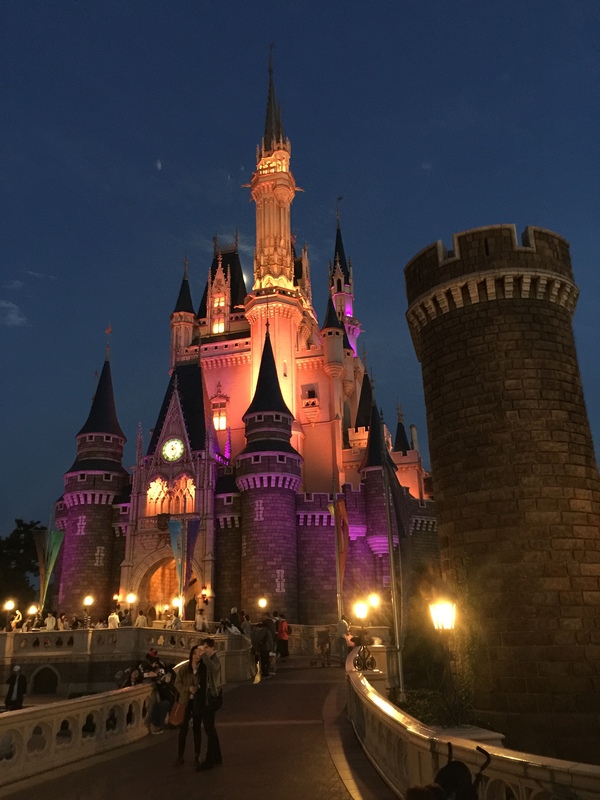 After a long journey from Kyoto, we (if you’re curious who the other half of ‘we’ is, it’s my lovely wife who isn’t nearly as big a Disney fan as I am so she’s a real sport for spending 4 nights here with me during our trip) were pretty hungry. 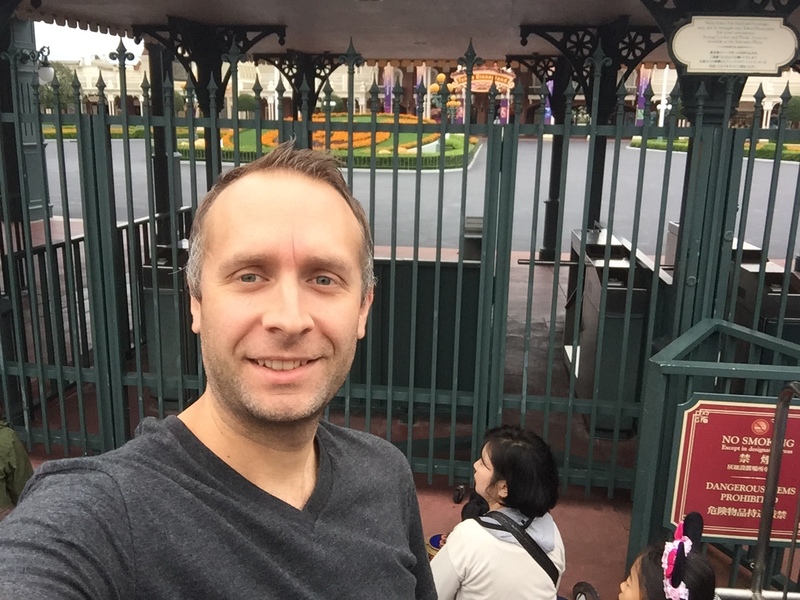 We figured that at 2:30 PM we would find a quick service location easily and with no line. We were wrong. 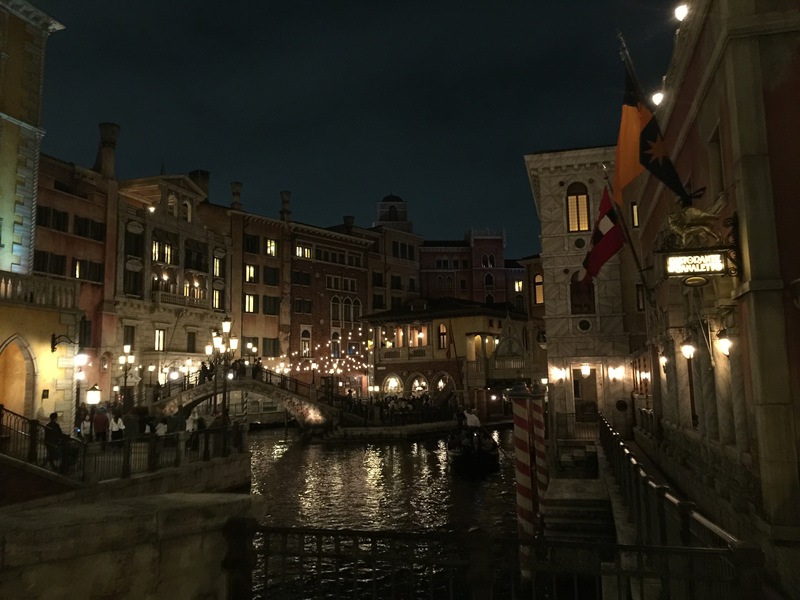 Because we didn’t want to walk around searching, I waited in line at Zambini Bros’ Ristorante for a while to grab some quick Italian food. The line took about 45 minutes and the hostess did not speak English, but she had a menu with English and pictures which I used to point at. Food came quickly and it was pretty tasty, but we were also starving. 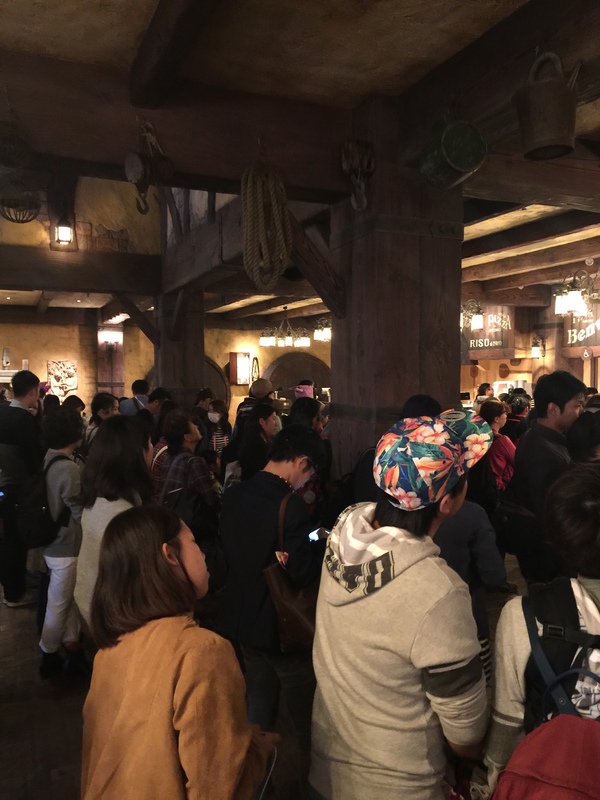 This is an ongoing theme, that lines at Tokyo Disney will be LONG with few exceptions. 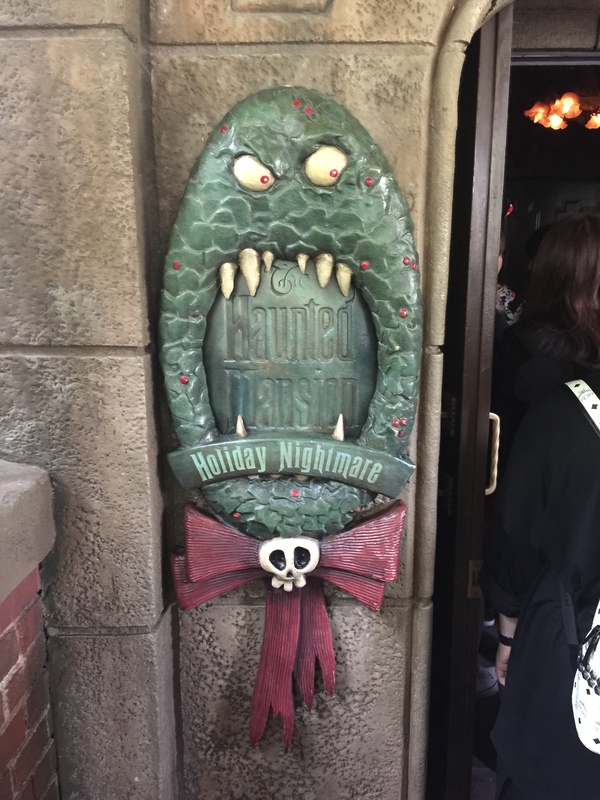 We were there in off season, and quick service food often had 45 minute waits. 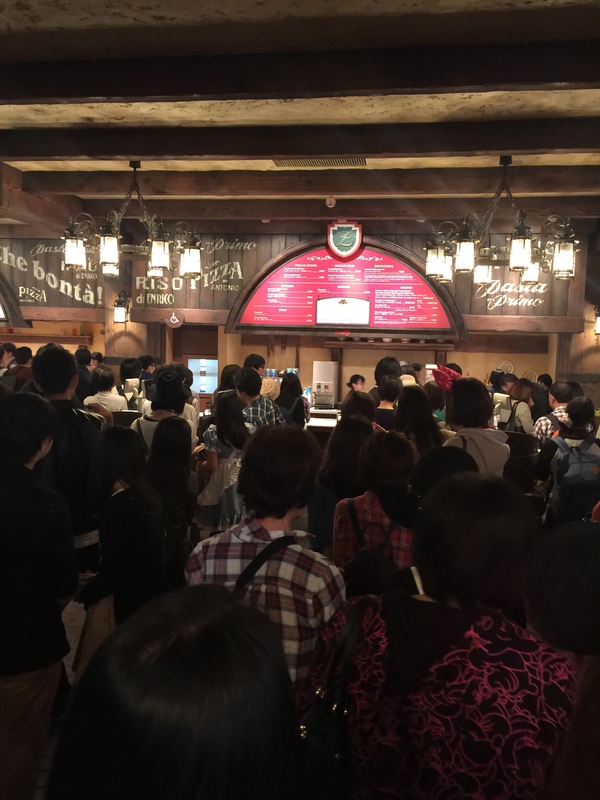 Lines for flavored popcorn would have 50 people in it. Attractions, too. You will wait in long lines here. 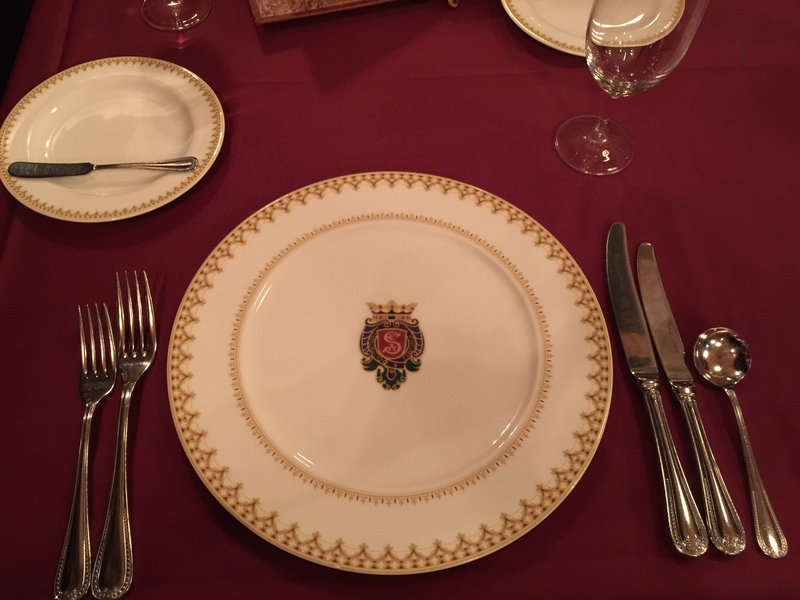 The only notable exception seemed to be table service restaurants. 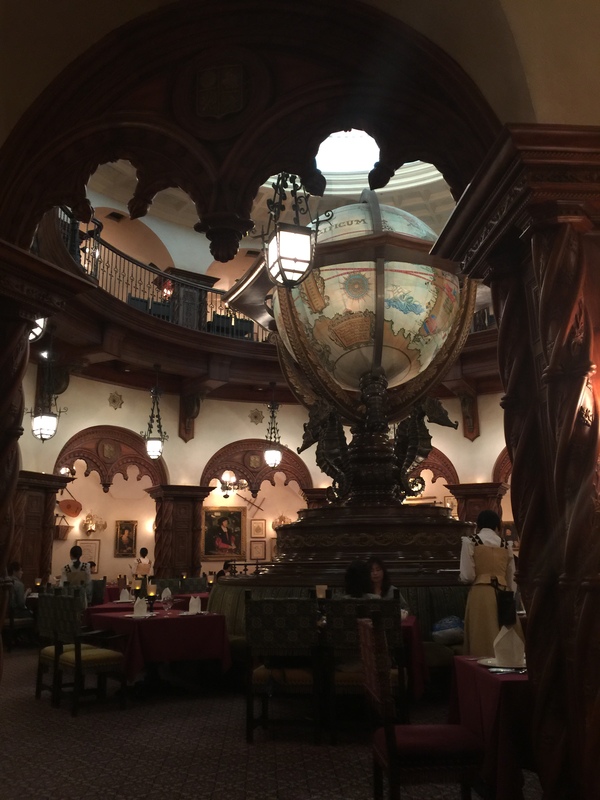 We walked into Blue Bayou at around noon and got a water-side seat right away, we waited ten minutes for a table at Teddy Roosevelt’s Lounge, and when we had reservations there never seemed to be a full house even at popular eating times. 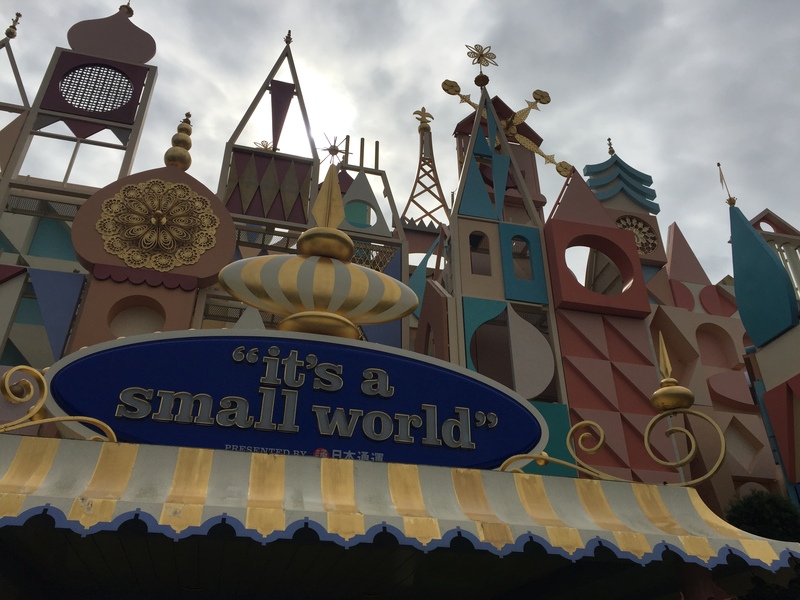 TIP: Most staff at Tokyo Disney do not speak English. But, they will always have an English menu with pictures that you can point to when you order. 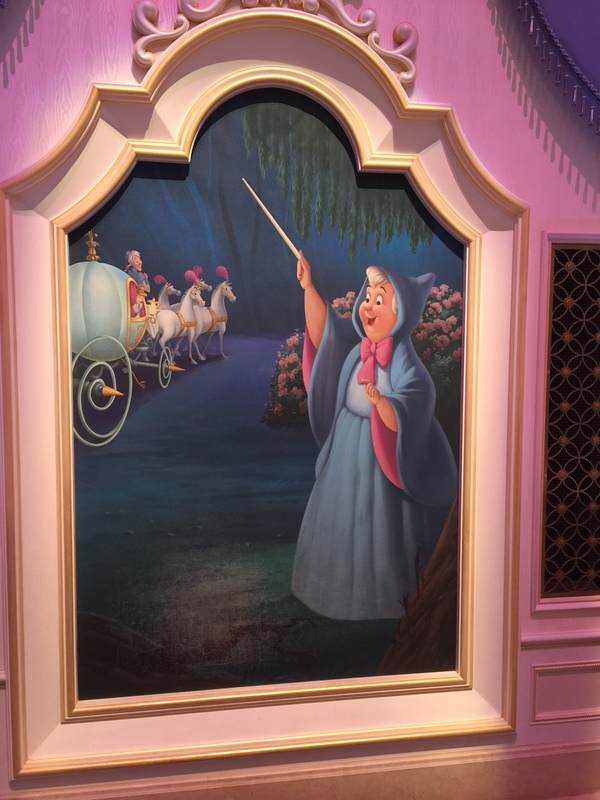 This was my favorite ride in the park. Its storyline is completely different than the Twilight Zone (and soon to be Guardians of the Galaxy) themes in the US parks. The architecture was enveloping and I even enjoyed walking through the queue because it was so intriguing and well done. The ride itself is, of course, exciting, too. A lot like the ride in Anaheim in terms of design but still an absolute blast. 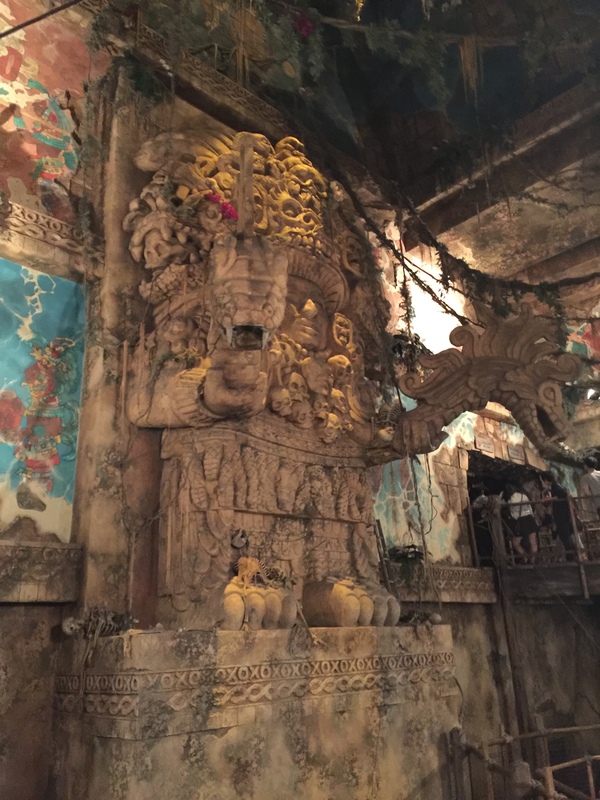 The theming inside still has a lot of unique elements, the queue has some amazing visuals, and I really enjoyed that Indiana’s voice in Japan sounds like a Mexican gunslinger. Be sure to use single rider here. The standby wait was 120 minutes and we got on in five every time we rode. 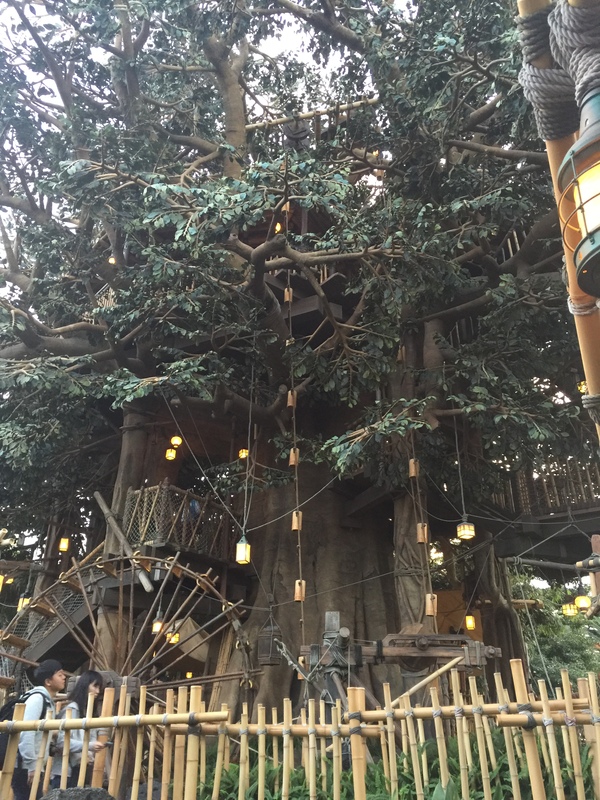 This ride is unique compared to US parks. It’s a fun vehicle system that’s basically dangling from a track. 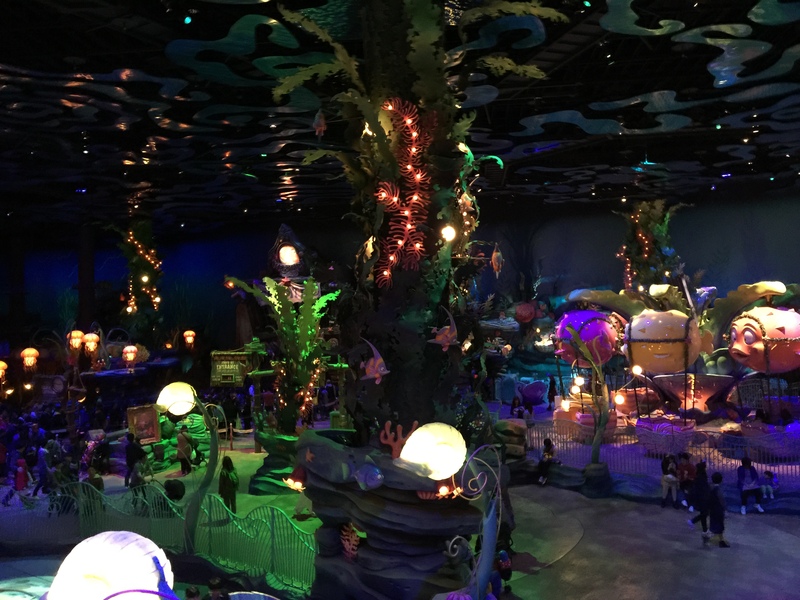 The ride itself is similar to the submarine rides in the US, but it’s a smaller ride vehicle and a bit more interactive since you get a joystick which lets you control a small flash light for parts of the ride. 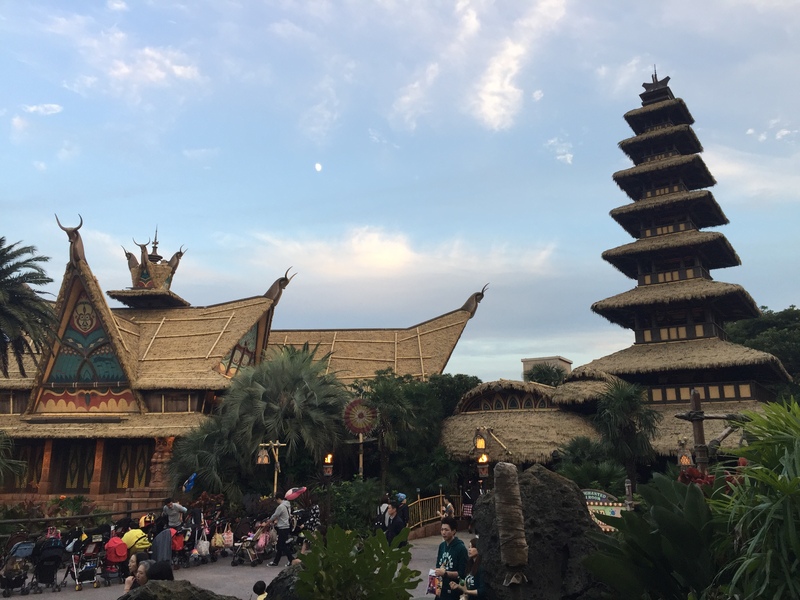 You can get a FastPass, but towards the end of the day there was often no wait. This one was a surprise, a ride we picked just because it was unique. 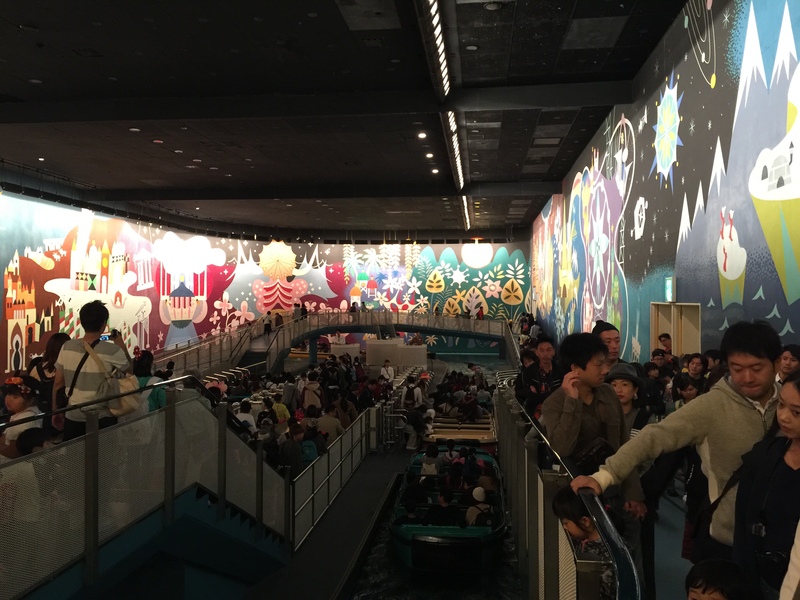 The ride system is a boat ride like It’s a Small World, and it feels a lot like that. Except, it’s a totally different character, Sinbad, who I’d never even heard of in the US. It was very colorful and enjoyable. This is a small, quick little ride that involves small ‘bumper boats’ in a foot of water going around a randomized path each time. 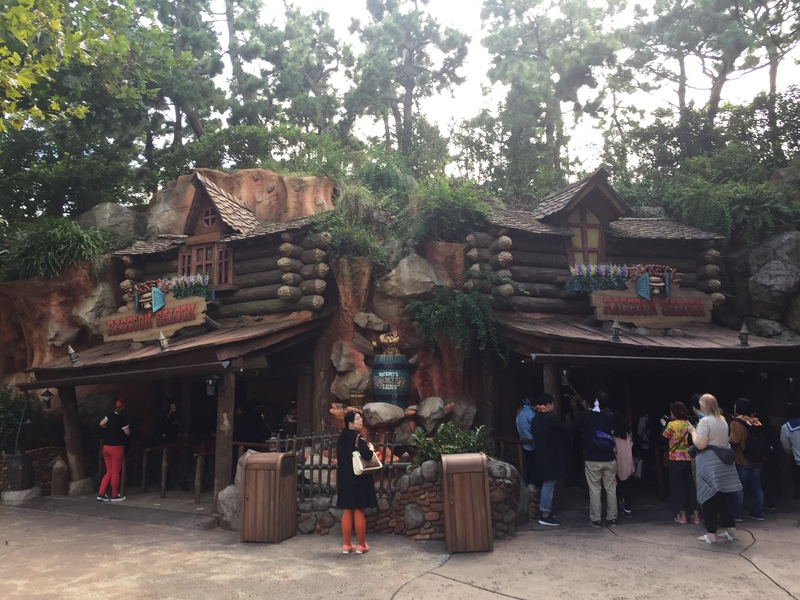 Another trackless ride system which gets none of the attention that Pooh’s Hunny Hunt does. 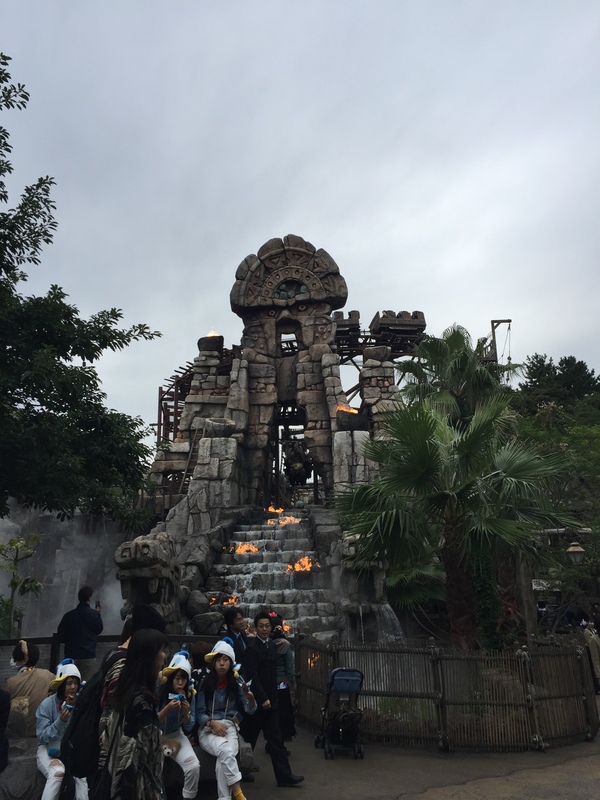 I found this ride relaxing and enjoyable, a nice way to take a quick break, but only if the line is 20 minutes or less. At night, you can typically walk right on. 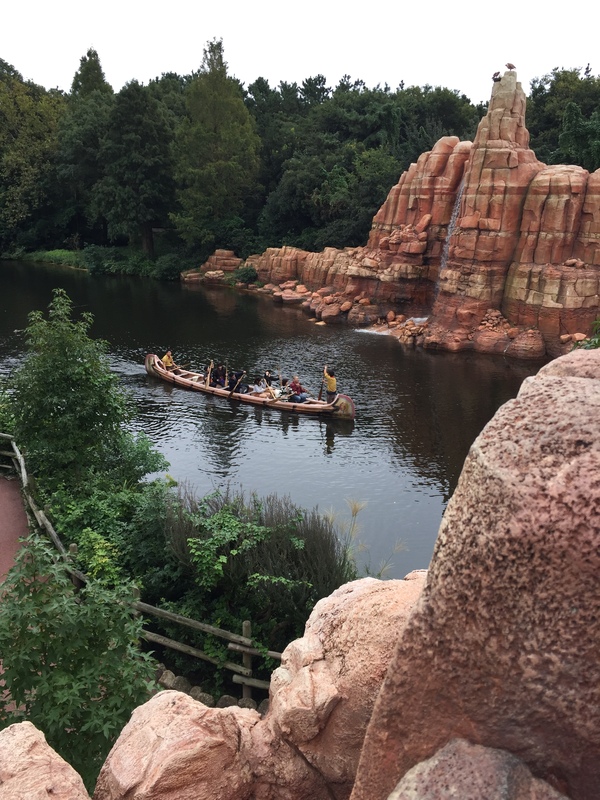 This is a boat that has a few stops throughout the park which you can take between lands. It’s a fun little voyage if you want to view the scenery, but its major caveat is that some docks don’t let you travel the entire course. 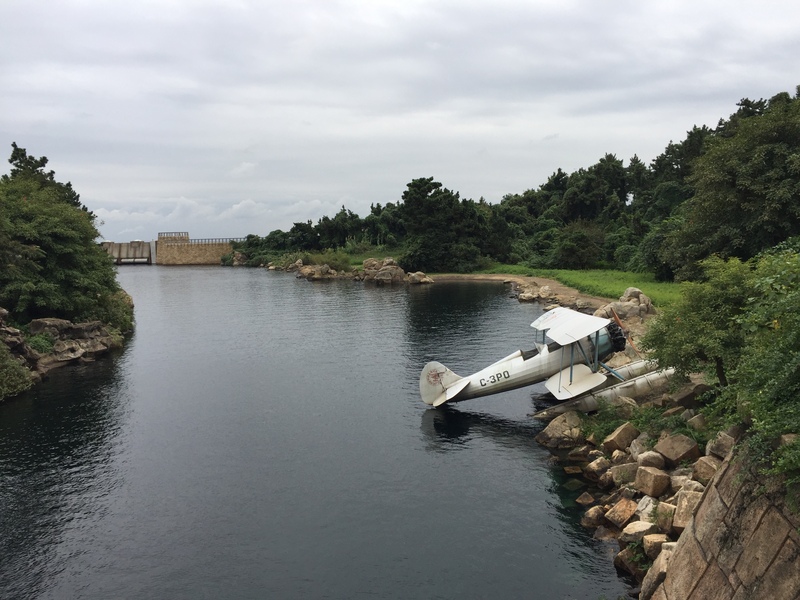 The dock near the Cape Cod area only lets you travel to the next stop. The dock near the Mediterranean area lets you go full circle. Boating through the crater of Mount Vesuvius was the coolest part. Another ride where single rider comes in handy- the standby was about 90 minutes and single rider, despite having just ten people in the line, got me in after around 30 minutes. Not as efficient as Indy, but still time savings to be had. 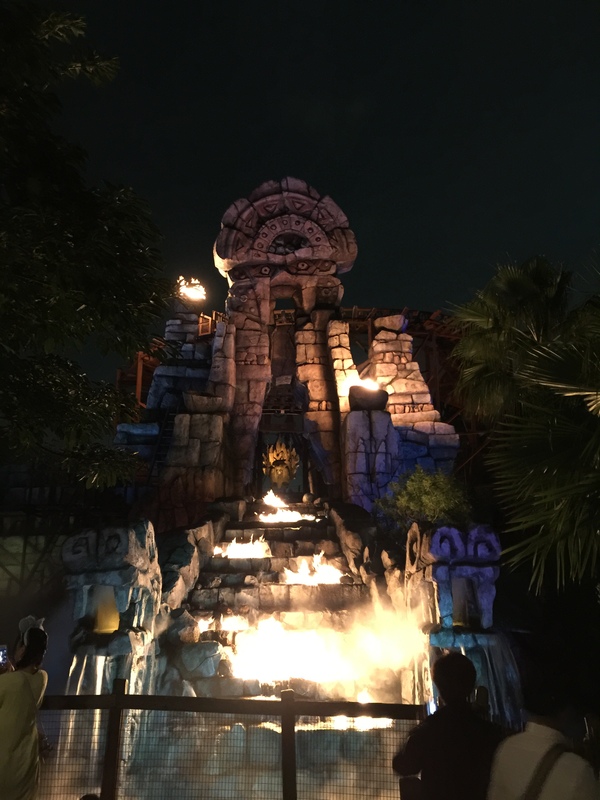 The ride itself had a great back drop- lots of fire and temples, and I was excited that the roller coaster had a loop. The ride was enjoyable but not that fast, the loop was anti-climactic, and it was a very quick ride probably less than 60 seconds. Give it a try since its unique, but I think Big Thunder in CA is more fun. Waited for about 45 minutes to ride these at night and it was enjoyable, but it was a short route and not a long ride. It’s another unique experience I’d encourage people to try but nothing hugely special except for the scenery. 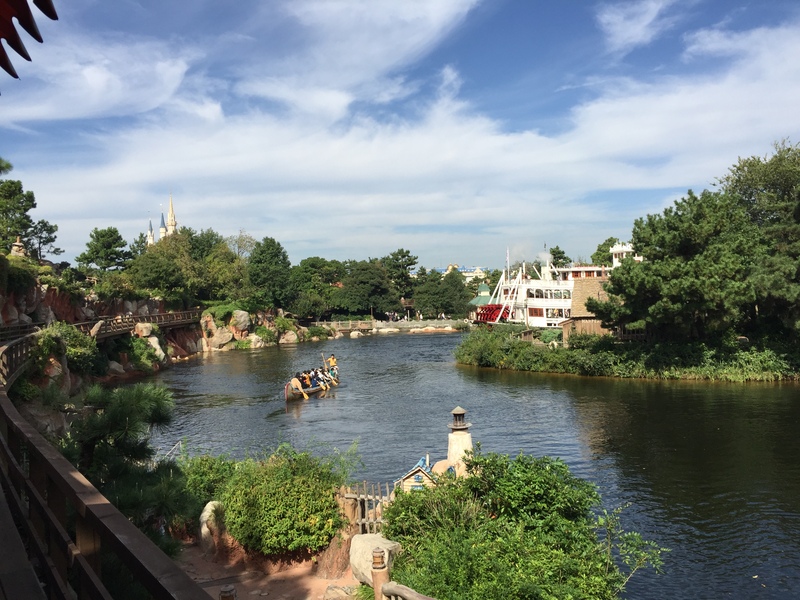 It’s a short ride that takes you between two sides of the park. It’s a quick ride, but usually you can walk there quicker than whatever the line is to hop on this train. It’s cute, don’t get me wrong, but not a must ride. Sadly, this attraction was closed for refurbishment so I didn’t get to ride it. 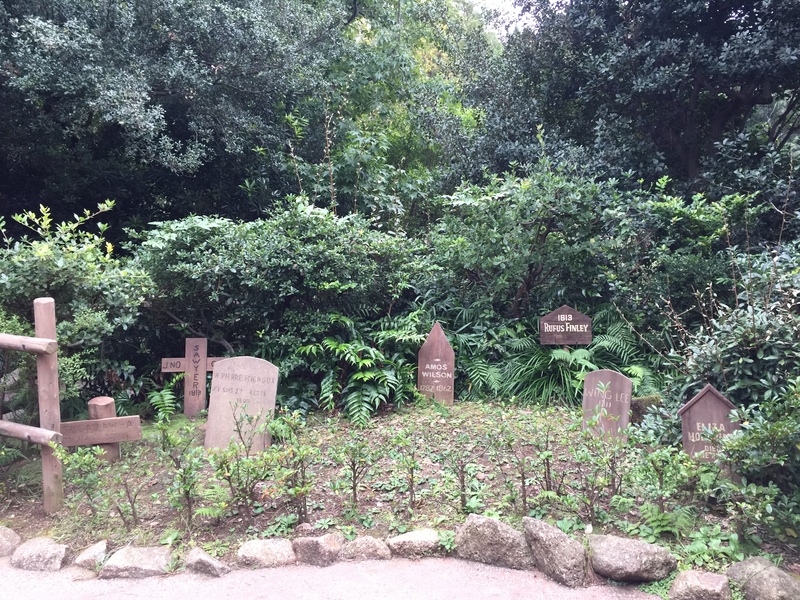 But, the theming that surrounds it looks incredible, in what is basically the crater of Mount Vesuvius. I read that this ride was identical to what we have in CA and FL, so I skipped it. The lines were always at least 120 minutes so it just wasn’t worth it to try. There were a bunch of rides (mostly the child rides) that we just didn’t do, so I can’t rate them. 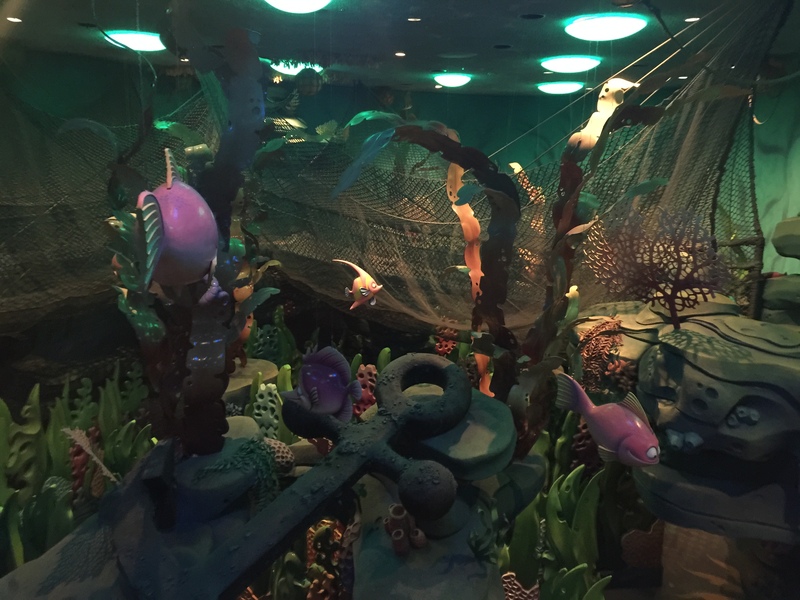 I also walked around Ariel’s Playground which is underneath Ariel’s castle, and hidden so well that I didn’t even know it was there until I accidentally walked inside. This was actually pretty awesome, so I’d advise everyone to check it out! 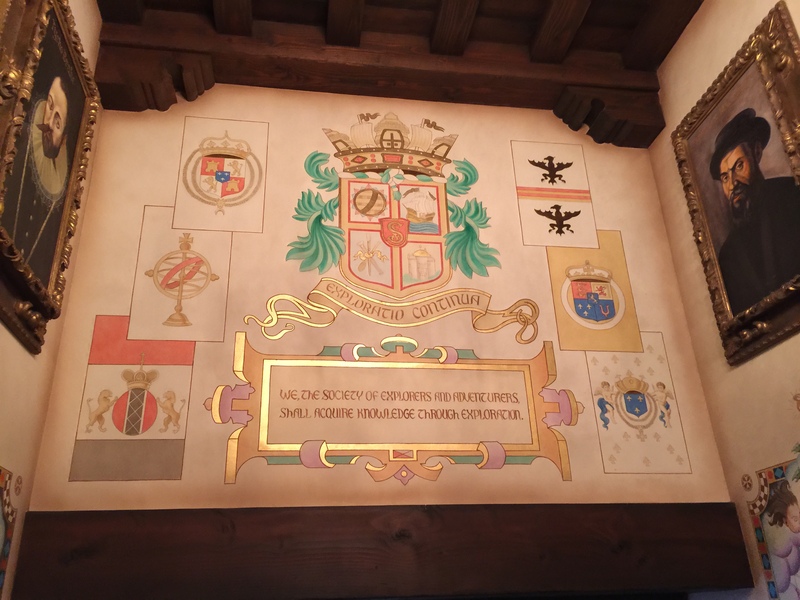 I also explored some of the Fortress Explorer rooms, but was sad that the interactive adventure they offer there was only available in Japanese so I couldn’t play. Nonetheless, both areas are a lot of fun to explore and I encourage everyone to do so. Let’s move on to the next subject: Table service Restaurants! I cannot say enough good things about this restaurant. The pictures you see online do not do it justice as its simply beautiful inside. To make it even cooler, even though we had a reservation I didn’t know much about the restaurant. 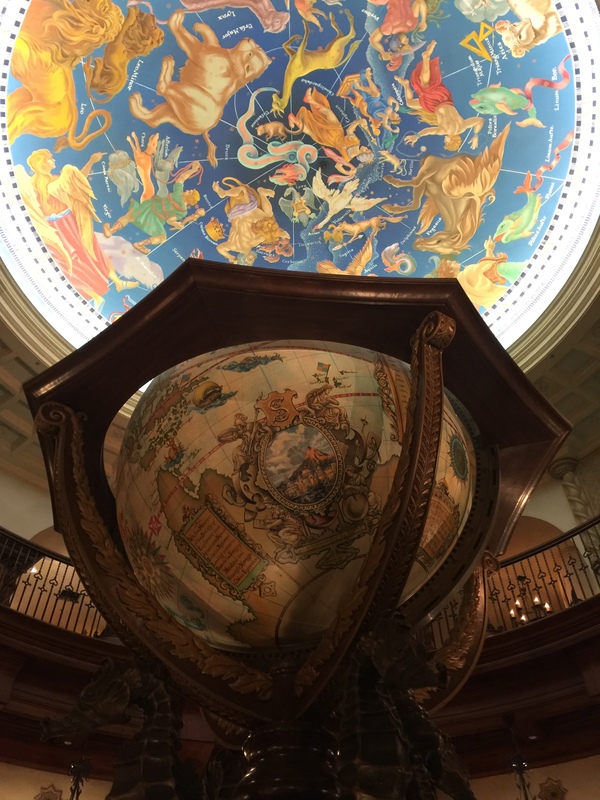 There is seating upstairs (great view of the globe) and downstairs (great views of artwork). 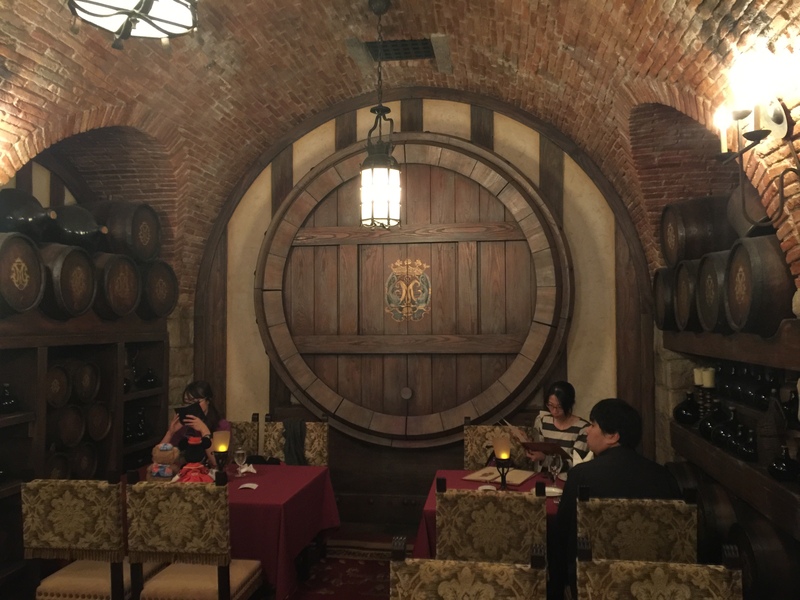 Then, unbeknownst to me, there is a secret dining area hidden in a wine cellar. 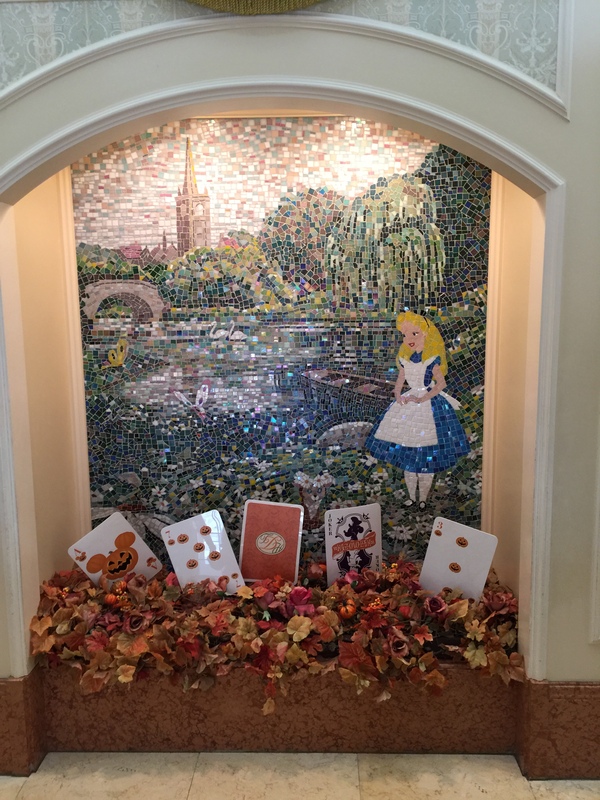 And when I see hidden, I mean that literally: you must push a hidden button on a wall which opens a fake book shelf wall and reveals the hidden room. Inside, there are big barrels of wine and rustic décor, along with about 6-8 tables. 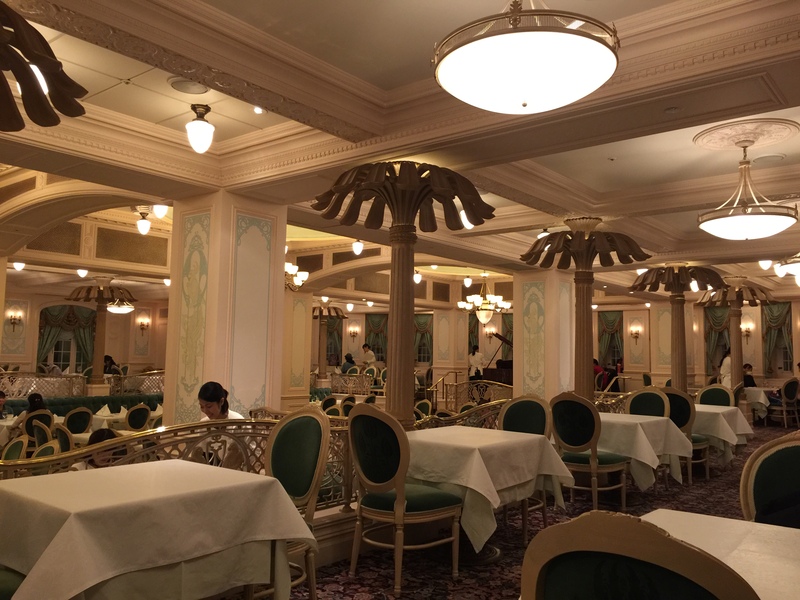 The menu here had a course menu (I do not think a la carte was an option, which was a common theme at Tokyo Disney) and every course was stunning. One thing I found amusing (and it wasn’t the first time we saw it) was a gal in the back was dining solo… with some of her Duffy Teddy Bears propped up on the table. I guess it was date night. 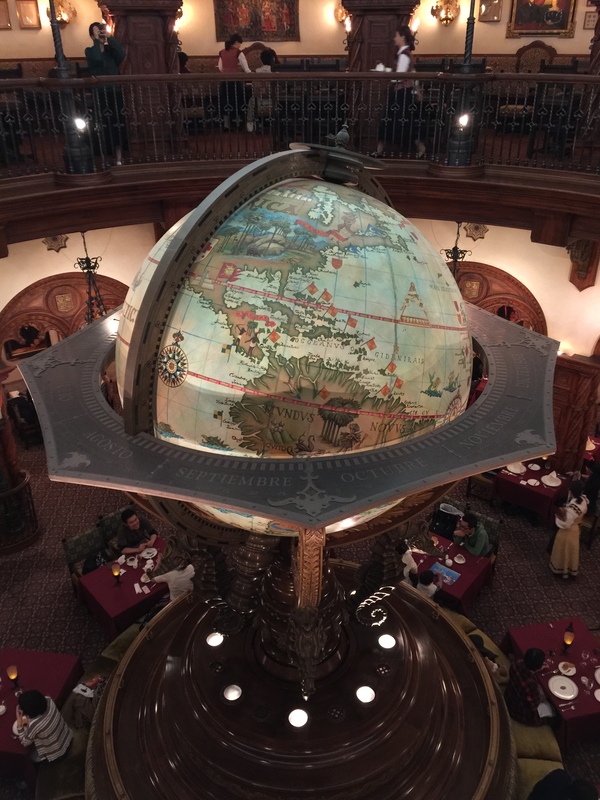 But, I digress: this was truly a magical dining experience- the ambiance, food, style and service was on par with my experience at Club 33, which is as strong an endorsement as this Disney fan can provide. 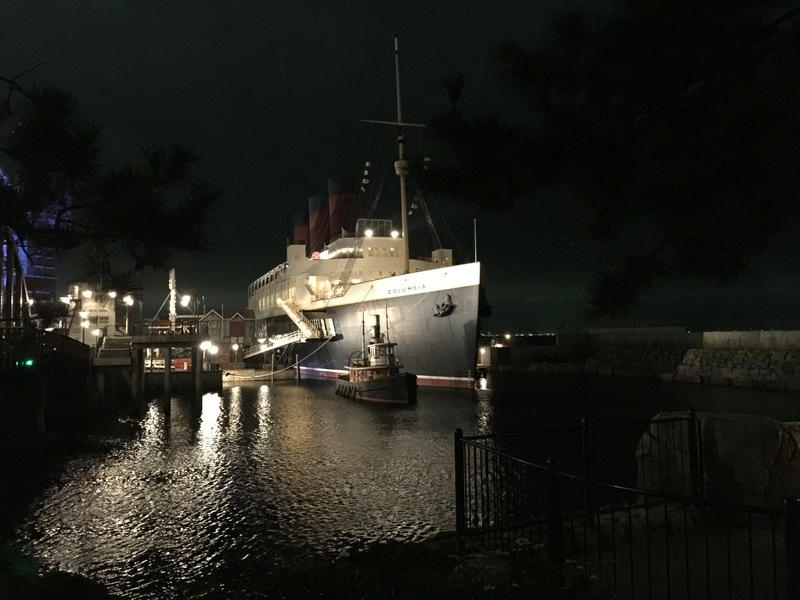 Seriously, Tokyo Disney nails dining, especially table service. Not quite on the Magellan’s level, but still so unique. 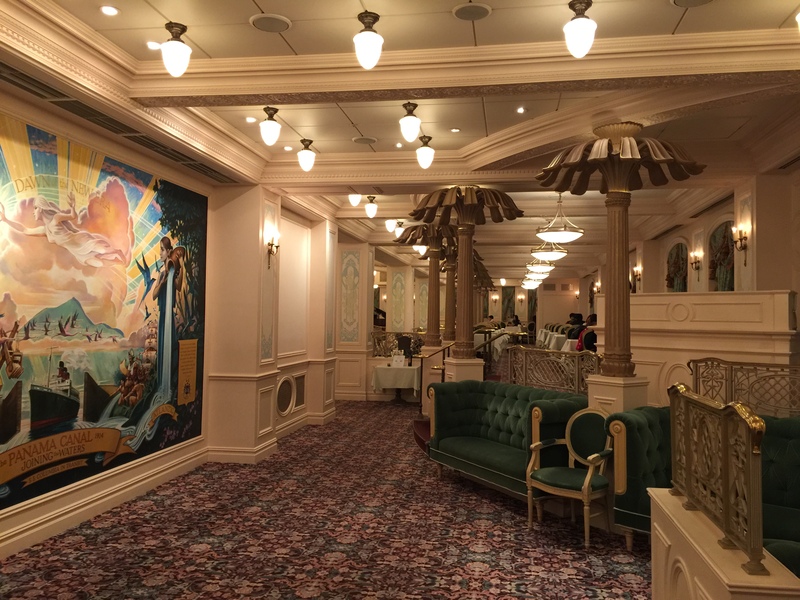 You step onto a boat and you feel like you’re dining on the Titanic. 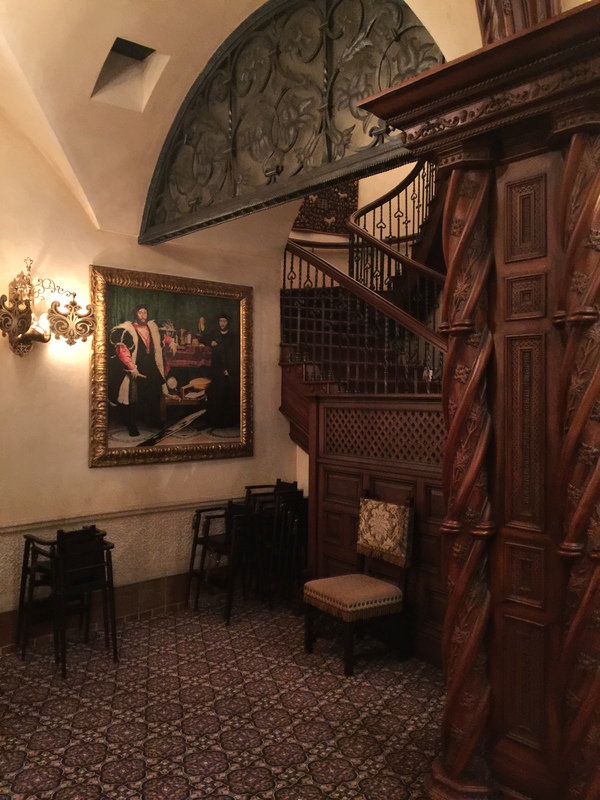 The service here was extraordinary, as was the ambiance and the food. 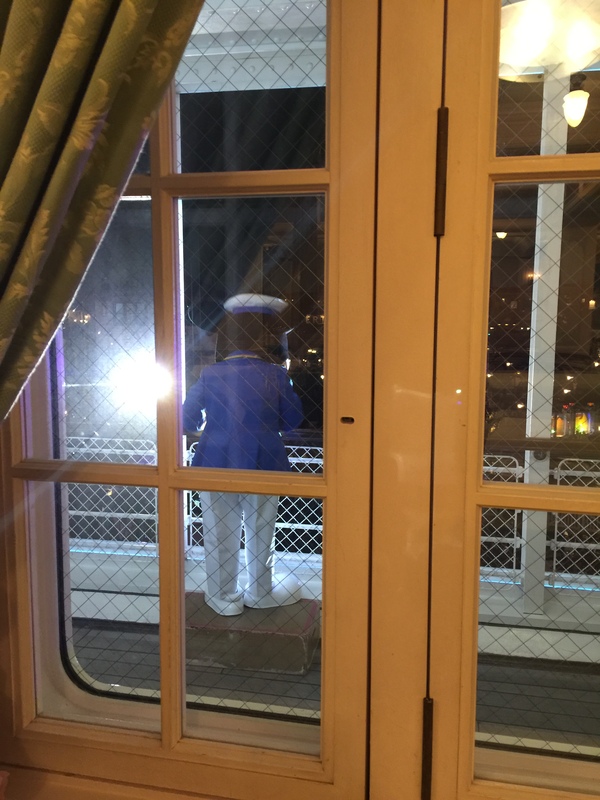 During our dining, they had a show going on outside our window, and at varying times Mickey and Goofy appeared outside our window waving down to the guests in the theater that was down below. On the floor right below the S.S Colombia Dining Hall is this quaint little gem. 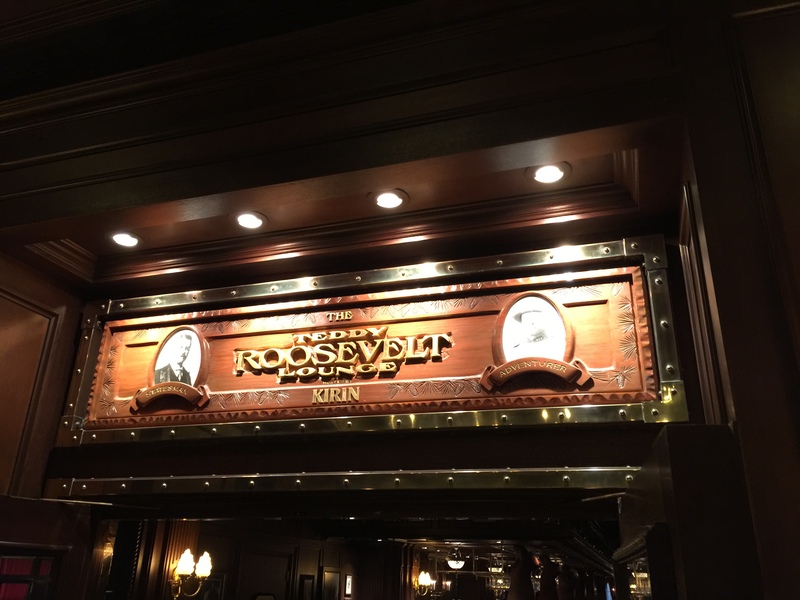 I don’t know if it’s because Japan is really into Teddy Bears (which were a result of Teddy Roosevelt) and Duffy, but they give Teddy Roosevelt a lot of love here. It’s a very rustic feeling, the way you’d except a national park lodge to feel circa 1880. 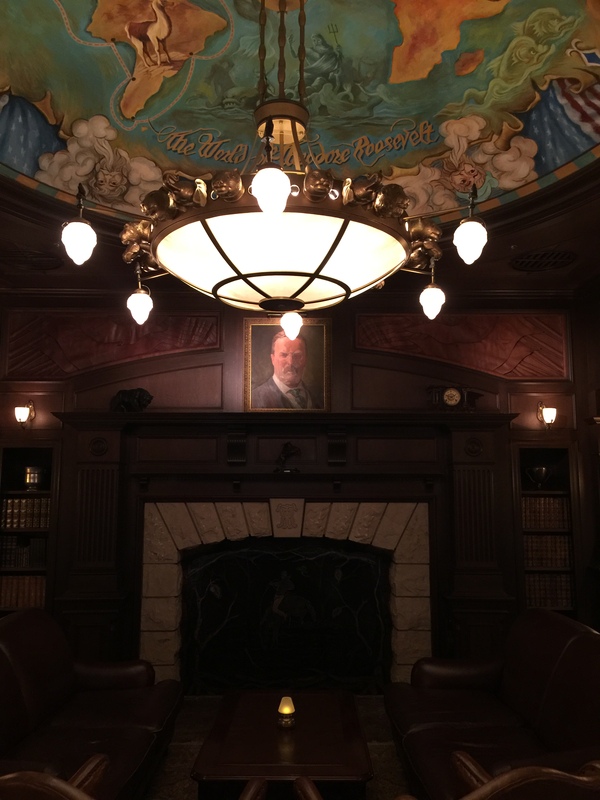 There are bear totems “holding up” the ceiling by the bar, and there is a ton of fun Teddy memorabilia throughout, including a huge gorgeous fire place. Once again, great service, ambiance, and food. 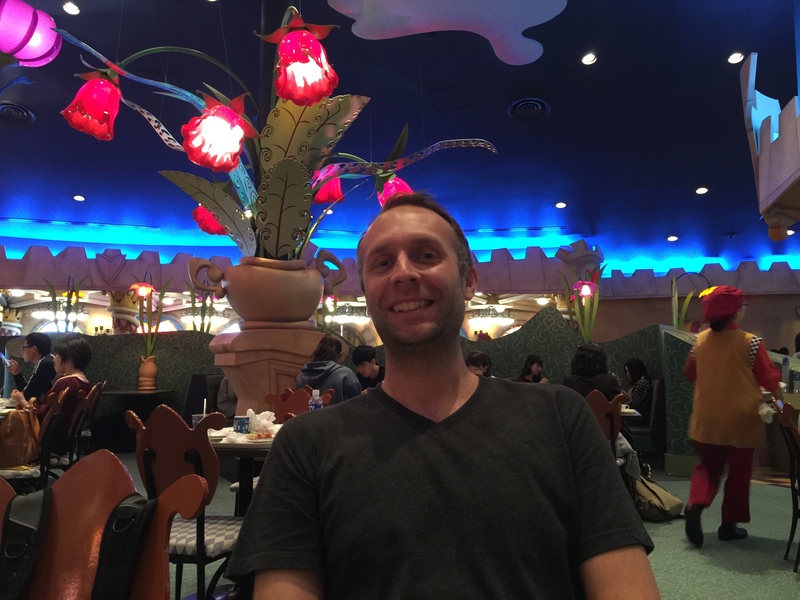 A fun restaurant in the crater of Mount Vesuvius with some solid Chinese options. The food was good, but I found the menu confusing and without fluent English speakers I had to step back to figure it out (they have a la carte and sets, but the sets here weren’t outlined as clearly since you picked selections from various parts of the menu). 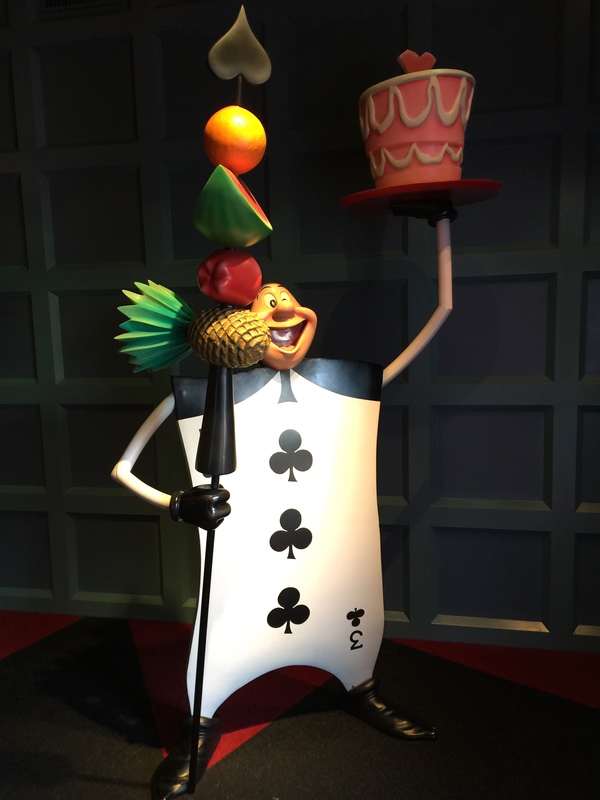 All in all, a fun place to stop in for a quick bite. Long wait considering we were there at a random time, but the food was tasty and the menu had good variety. This place has tons of seating, too, indoors and outdoors, and on both floors. Mostly a bakery, but they do have sandwiches here. But, we enjoyed several treats here at varying times: the chocolate croissants, muffins, and the alien mochi balls!! All of which were delicious. This place sometimes has a pretty long wait, too. 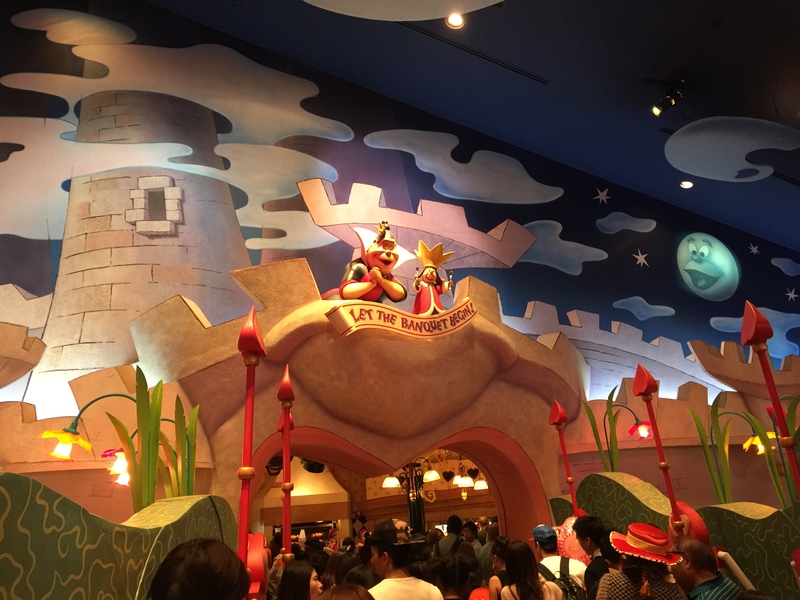 The theming isn’t anything that exciting, and the food is burgers and fries type. My fried chicken sandwich was quite good, though, so not a bad place to grab a quick bite. We also indulged in some flavored popcorn while in this park, but only two flavors because the lines here were so long sometimes. It’s because they sell refillable popcorn buckets so you can get refills at a deep discount, and people apparently live and breathe by these things. The two flavors we tried were cappuccino and caramel. Both were enjoyable, but my wife and I both preferred caramel. Some flavors, like curry, seemed gross. Even the small walking past one of the Curry popcorn stands made me a bit meh. 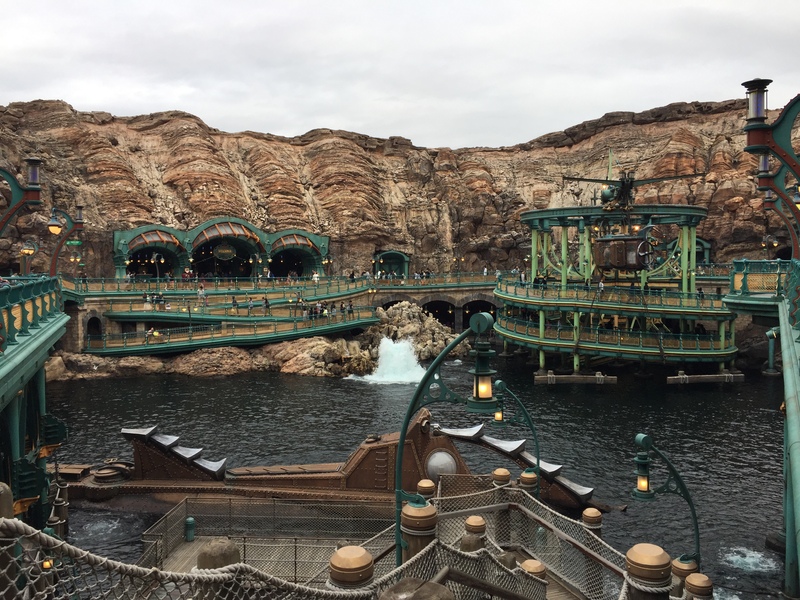 My final thoughts on Disney Sea is that it’s an amazing park, truly one of a kind so far as I can tell, certainly compared to what we have in the US. 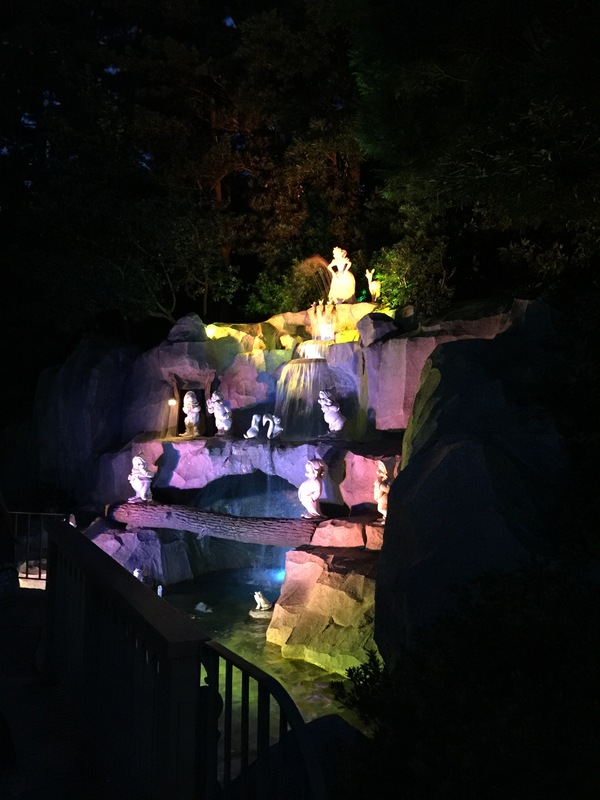 Its theming is truly amazing, and you’ll feel immersed in every land, and love just peering at all the details which are extensive. The table service restaurants were all top notch, and the quick service food was pretty tasty, too. 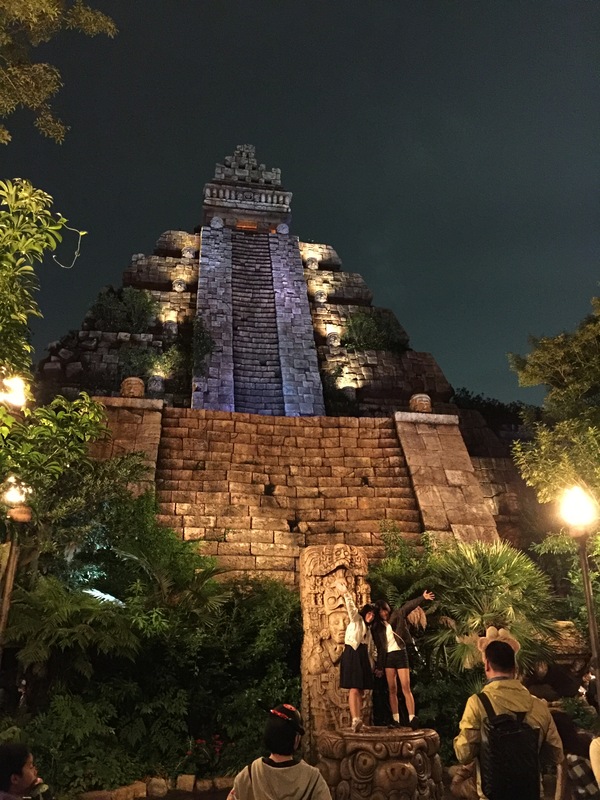 I think Disney Sea could use a few more E-ticket attractions, as once you wear out Indiana Jones and Tower of Terror, you’ve kind of maxed out the thrill rides. Granted, Journey to the Center of the Earth was closed, so maybe that would have helped in this case. 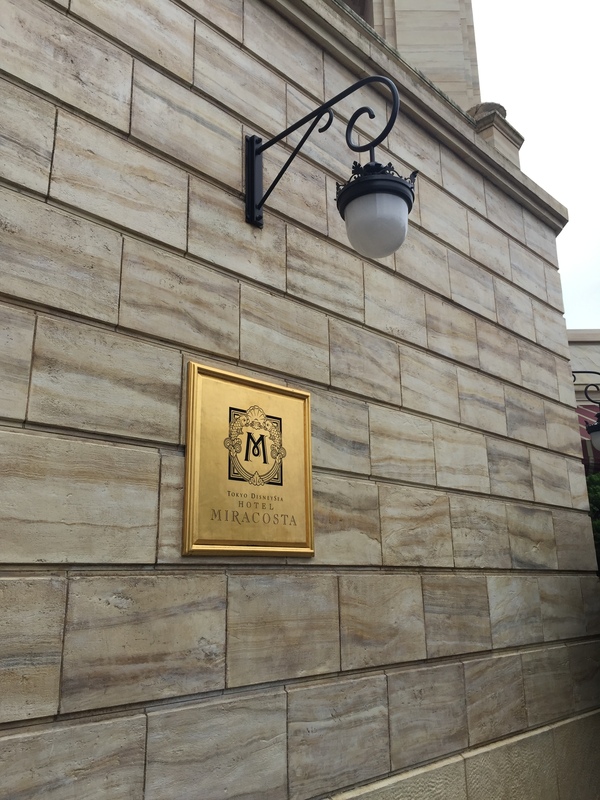 We also really loved that Hotel MiraCosta was literally inside the park, and the private entrance was supremely helpful. TIP: The pool and hot tubs at the MiraCosta are not free to use for guests. They have a $20-30/person charge if you want to use it, which is a shame, because they look beautiful but I couldn’t justify paying that to use them. They run a well-oiled machine here, though, at 7.45 AM on the dot they open the gates and people rush in. 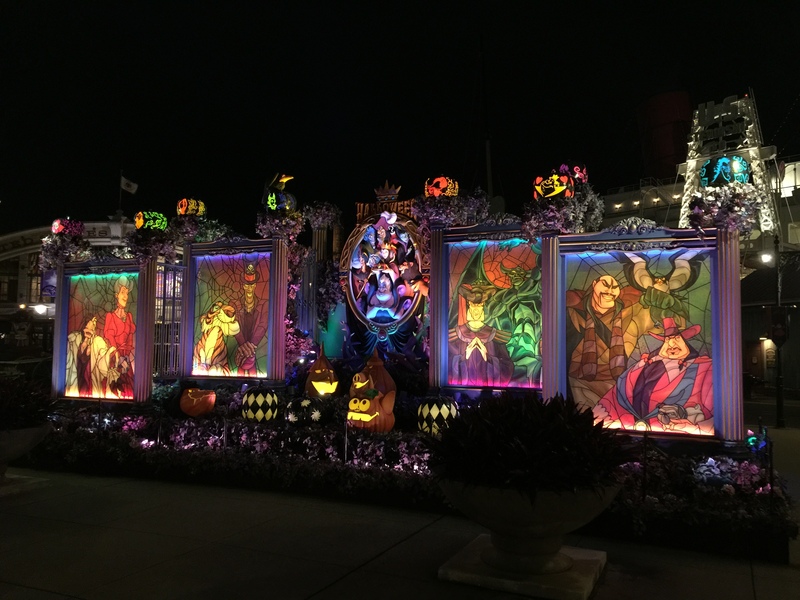 They had characters pop by and say hello behind the gates, and also had several staff holding signs that say “please don’t run” and to my surprise most people obeyed… but we were all “fast walking”. My plan of attack was to do Monster’s Inc Hide and Go Seek first, then do Space Mountain, then get a Fast pass for Pooh’s Hunny Hunt. 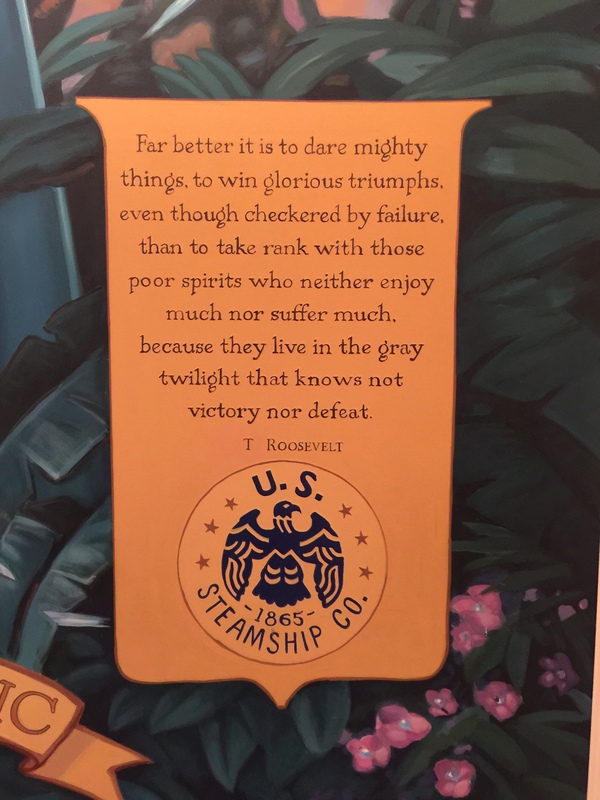 I was successful in this plan, but I was shocked that by 9 AM, lines for some attractions were already 120 minutes long, and Fast Passes for Pooh were almost gone. 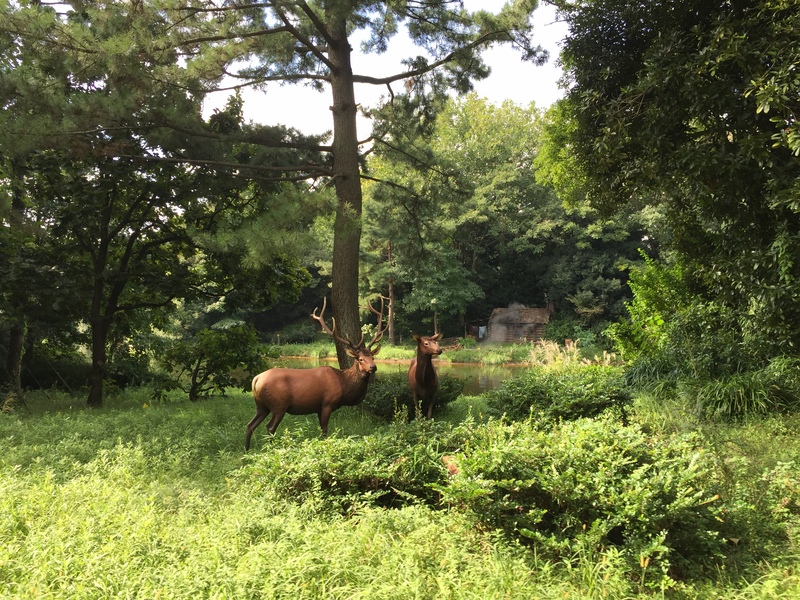 And this was off season so I cannot even imagine this park in the summer or peak times. 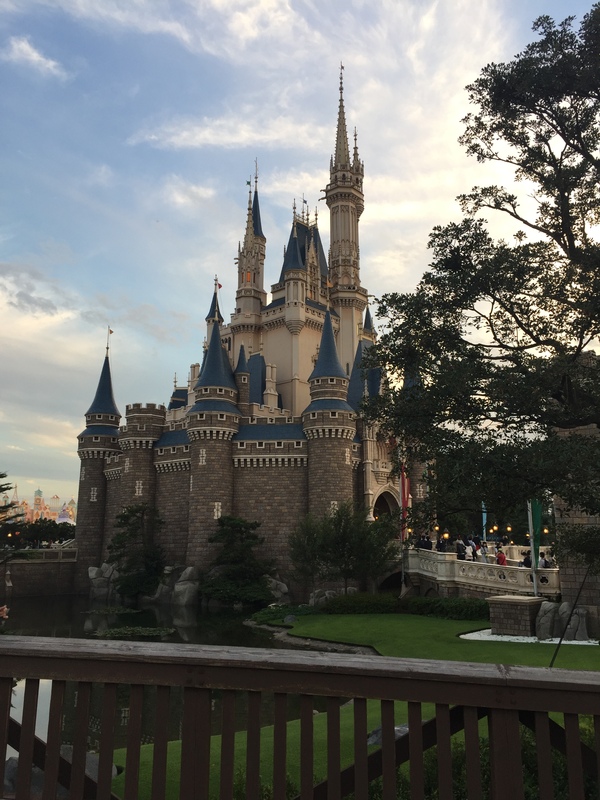 At any rate, my first impression of Tokyo Disneyland was that it was very clean (even cleaner than the US- partly because no bathrooms in japan have paper towels. It’s solely hand drying machines, so there is far less trash that might spill out) and staff were incredibly friendly and helpful (yes, even more so than the US). For example: I’d open a map to see where I was, and within 7 seconds a cast member would be asking where I wanted to go, and then they’d lead me there. 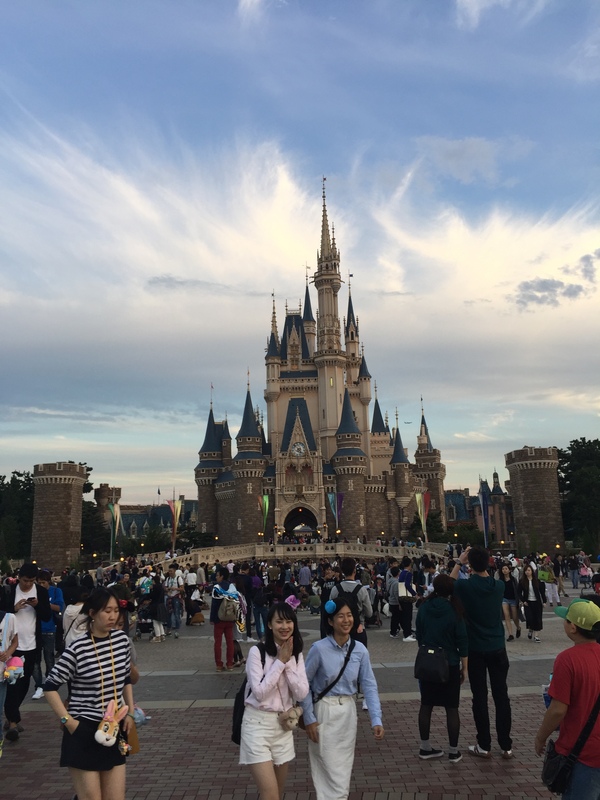 Another thing about Tokyo Disneyland? 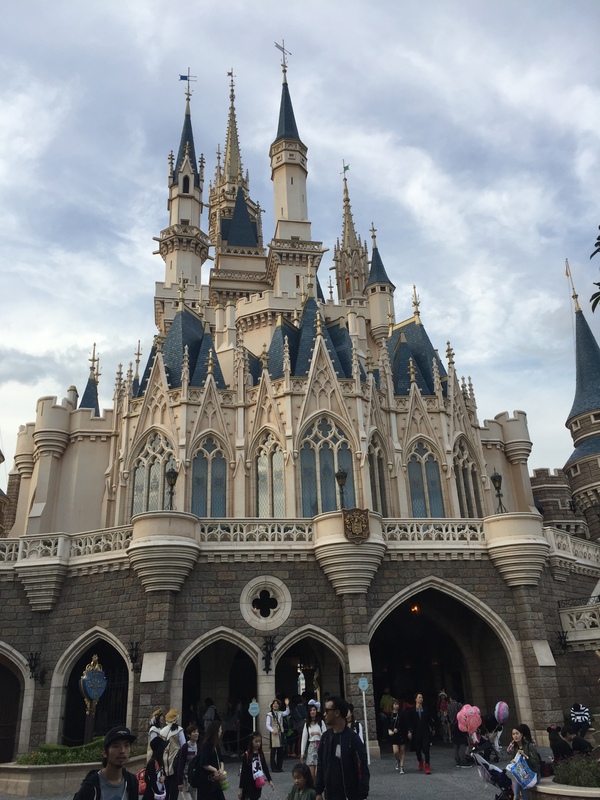 It feels a lot like Disneyland in CA and the Magic Kingdom in FL. 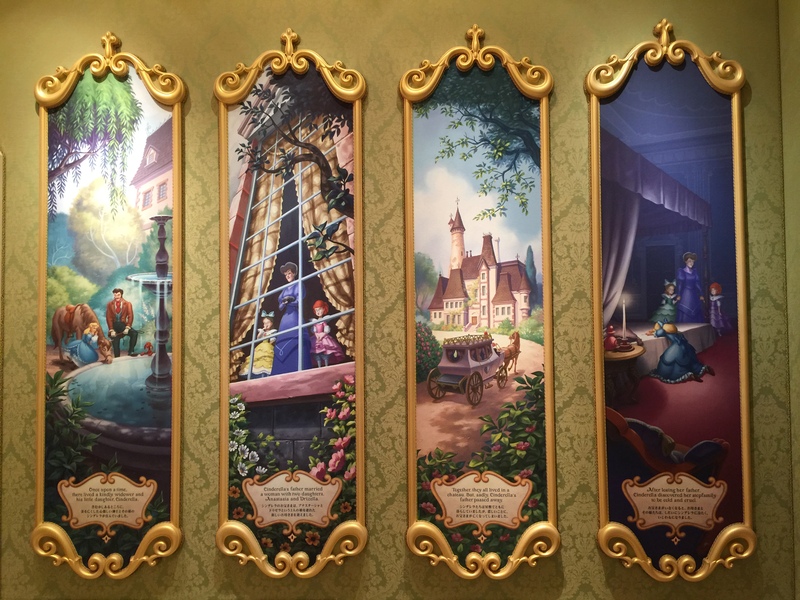 The layout is pretty similar, with just enough differences to disorient US-Disney-gurus like myself into going slightly off course a few times. 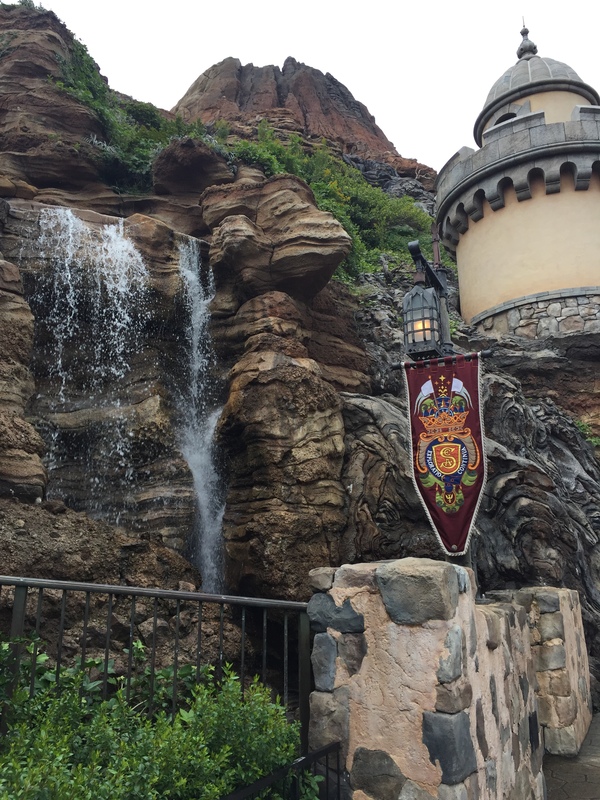 The castle is very similar, and a lot of the rides here are very similar to the US, too, with a few unique attractions. 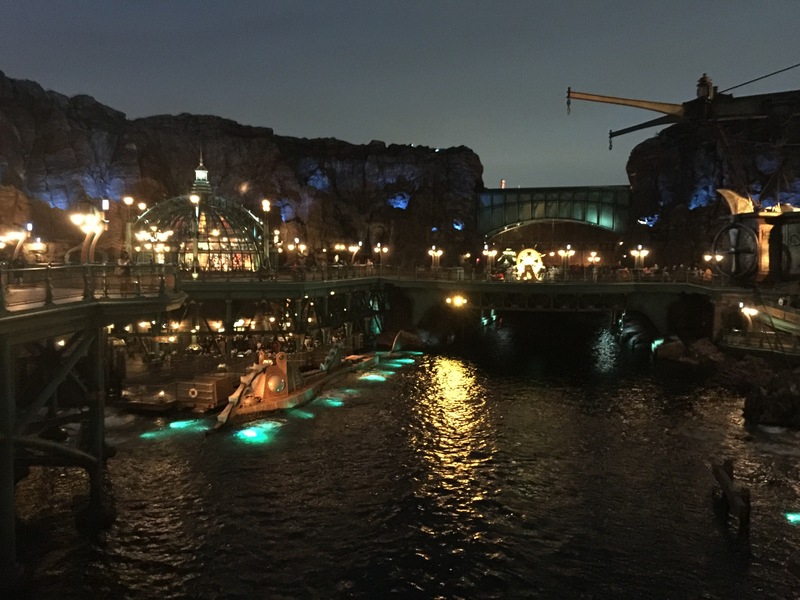 For that reason, if you’ve only got one day in Tokyo Disney, you should absolutely go to Disney Sea, as it’s by far the more unique park. 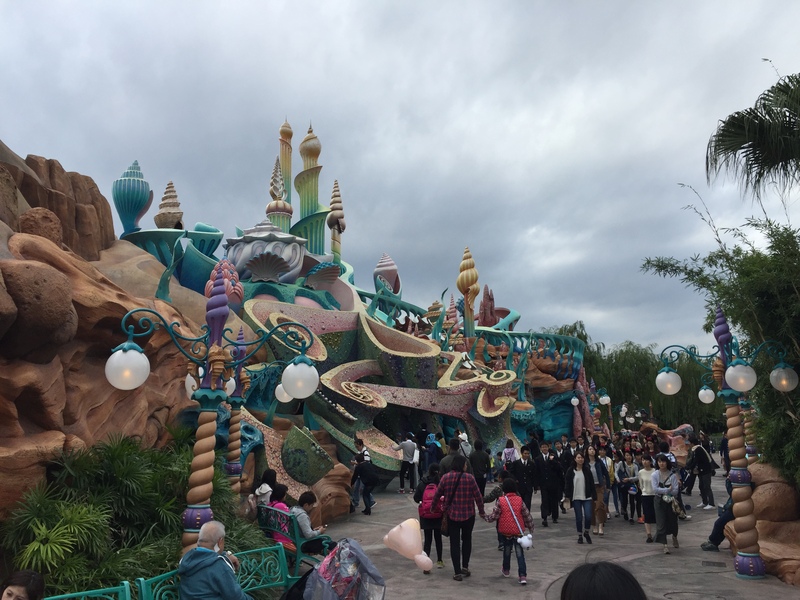 Alright, similar to Disney Sea, let’s break off chronologically and give you the scoop on the rides and the food, but I am only going to talk about the rides unique to (or significantly different in) this park. 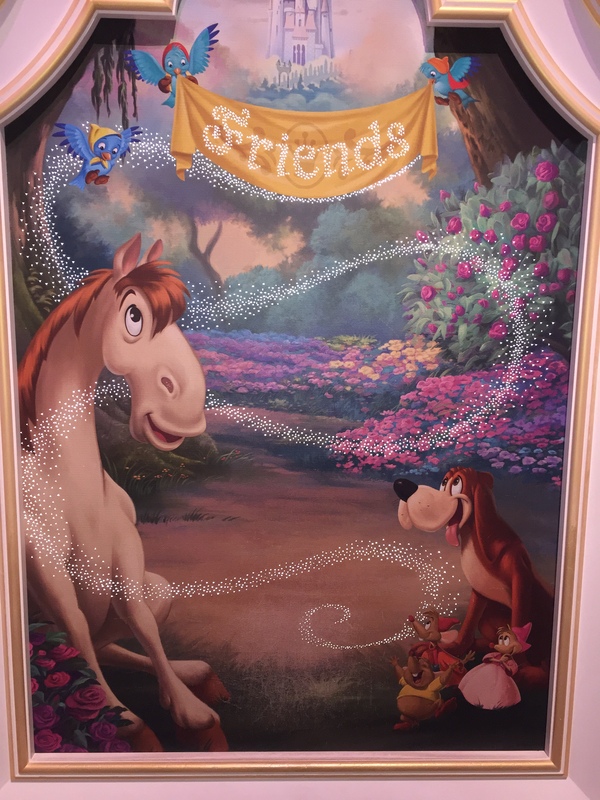 As a grown adult who doesn’t care that much about Pooh (the character…), I wanted to do this for the sake of the trackless ride system. I walked off really having enjoyed this entire ride. 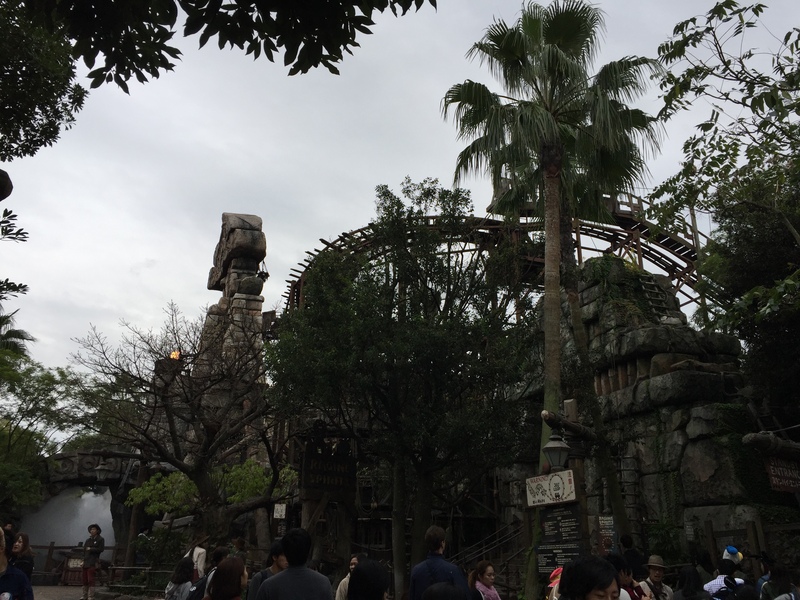 It’s long, it’s fun, the scenery is great, and the trackless vehicle system is such a vast improvement over tracks. It’s hard to explain until you experience it, but it’s such a more seamless experience. 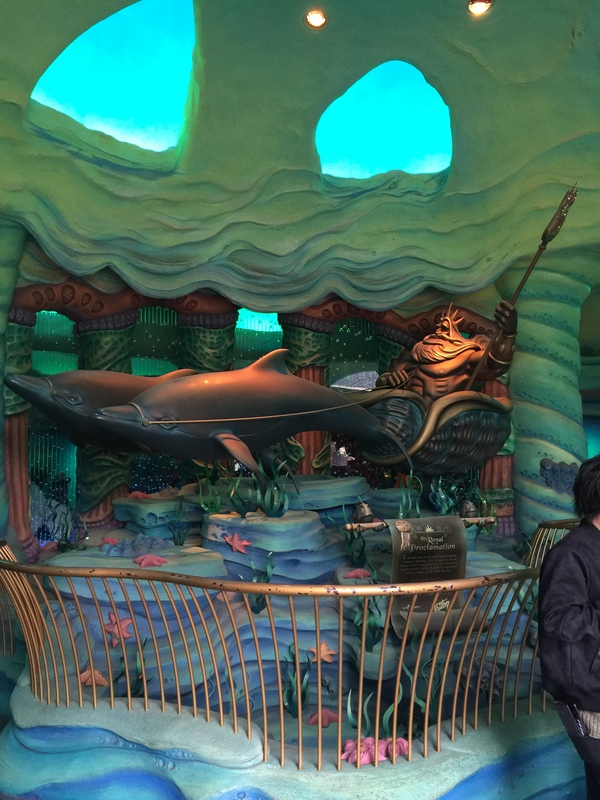 I ended up riding this (via FastPass) like 3 more times. 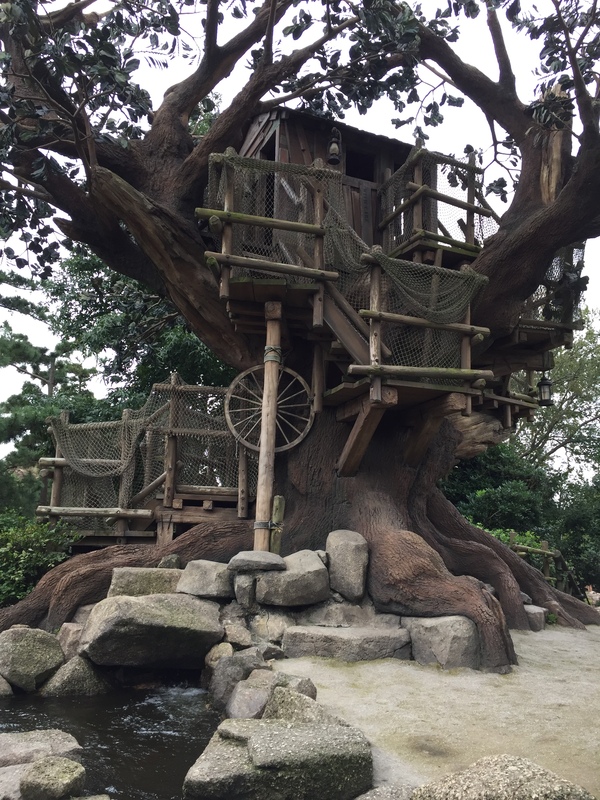 Maybe it was the exhilaration of feeling like a kid again, but I really enjoyed roaming around and exploring Tokyo’s Tom Sawyer Island. It had similar components but was still very unique so I’d recommend checking it out. 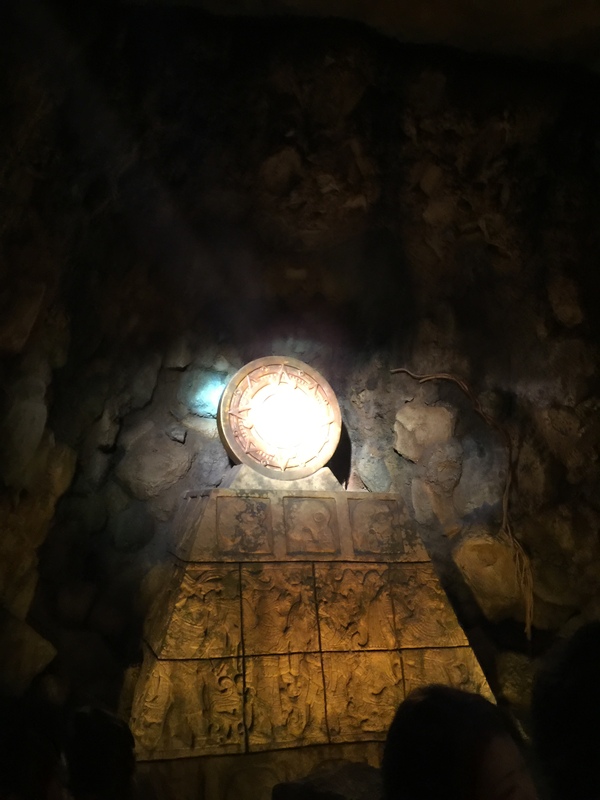 Ok, this may be blasphemous, but if you take the flash lights out of the equation, this ride is a lot like what we have in California Adventure. Was it fun? Yes. Were the flash lights fun? Kind of. Is it ever worth a wait more than 30 minutes? I don’t think so. I don’t get why this is such a favorite. Yes, this is a clone but with one huge difference: It’s all in Japanese! For that reason alone, you should check it out. It’s also much better maintained than CA, so it feels a lot newer (to be fair, it is a lot newer). This was actually pretty fun. 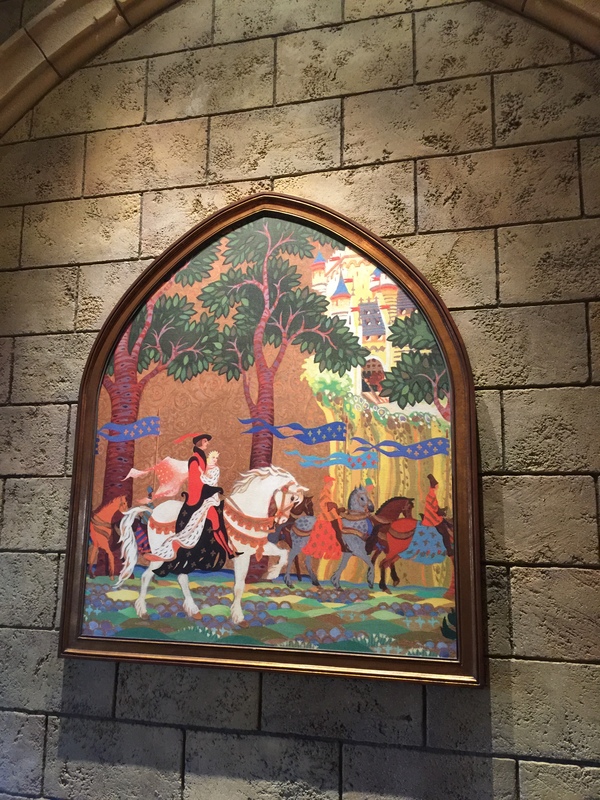 It was nice to stroll through the castle, and some of the paintings on the wall look different in flash photos than they do in normal light, so that was cool. I’d recommend this if the wait is less than 20 minutes. 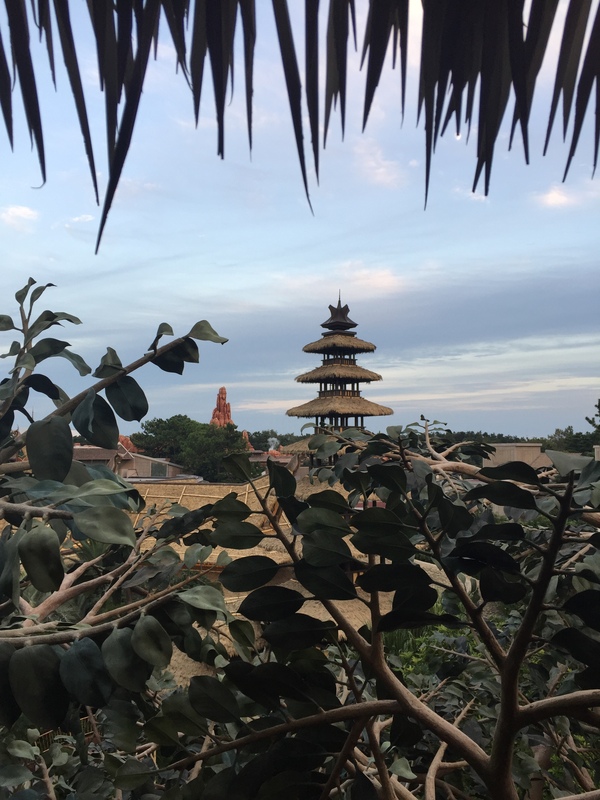 This is unique enough to put it on this list, in the sense that there is only one stop, and you get some nice views of Jungle Cruise, Tom Sawyer Island, Mark Twain riverboat, etc. 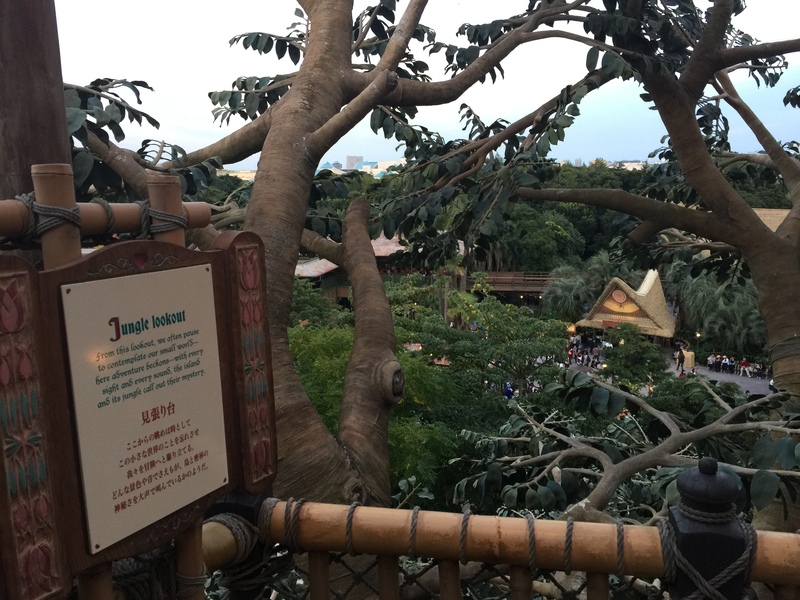 The problem is the first half of the ride you’re basically looking at bamboo and plants. 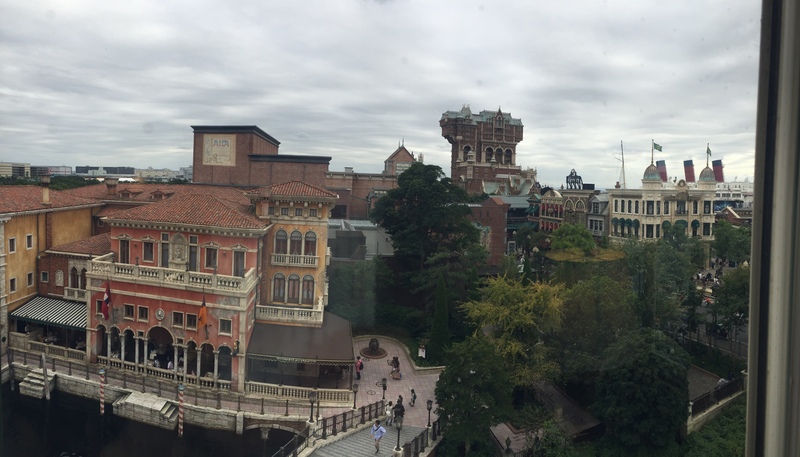 Then you get the river view, then you get the panorama circa Disneyland CA. Not a bad way to rest your feet if there is a short wait. As far as all the ride clones that we have in the US, here is a quick list of how they may differ slightly. Rest assured, they’re all just as fun as they are in the US… but if you’ve got limited time, you can skip most of these if you need to and not have missed much. 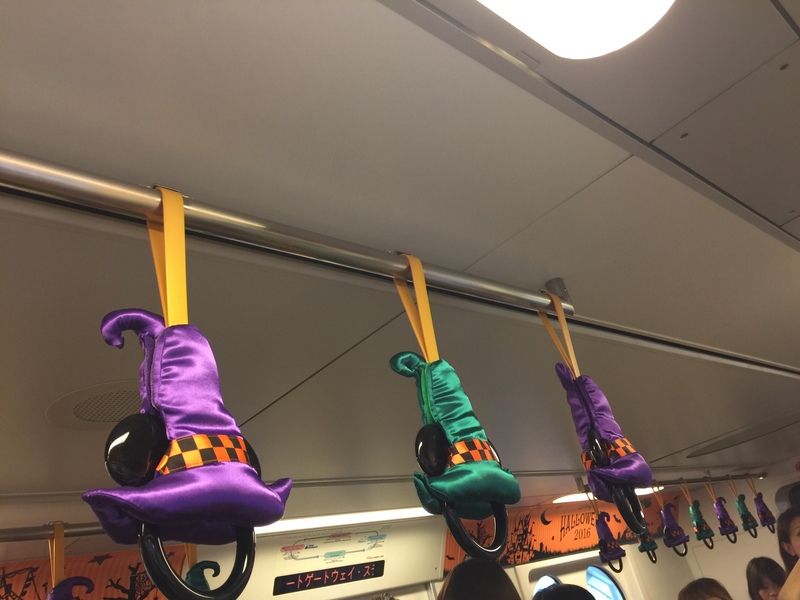 They really seem to be on the Halloween bandwagon out in Japan, so I was really impressed with all the decorations here which I think trumps what we do in the US. 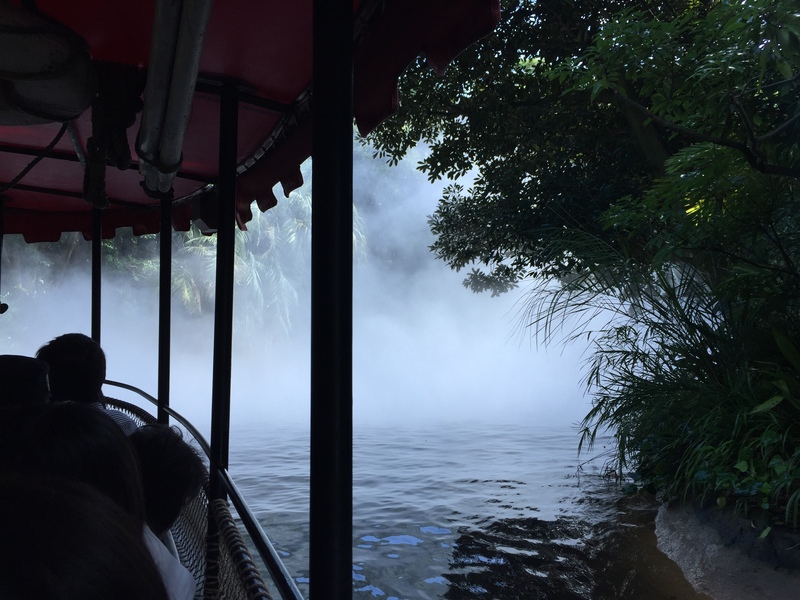 A few effects that made it stand out as a bit better: first, there was one part where they overlay a thick mist which you sail through which was cool. And, second, the temple has some awesome effects when you get inside, so that was new and cool. I wanted to ride it a second time during the night time, but the line was always too long to justify doing it again. Just one drop (unlike Disneyland CA), and you unload at the bottom of the ramp, though, which makes the line move a bit more seamlessly in my opinion. Rarely had more than a 20 minute line, so we did it a few times. Not recalling any differences here. The ending has not been refreshed like the CA version, but it’s still a lot of fun. Their version of Autopia, which was a lot shorter and seemed to be a simple figure 8 track and less scenic than some US versions. You know what the best part of it is? 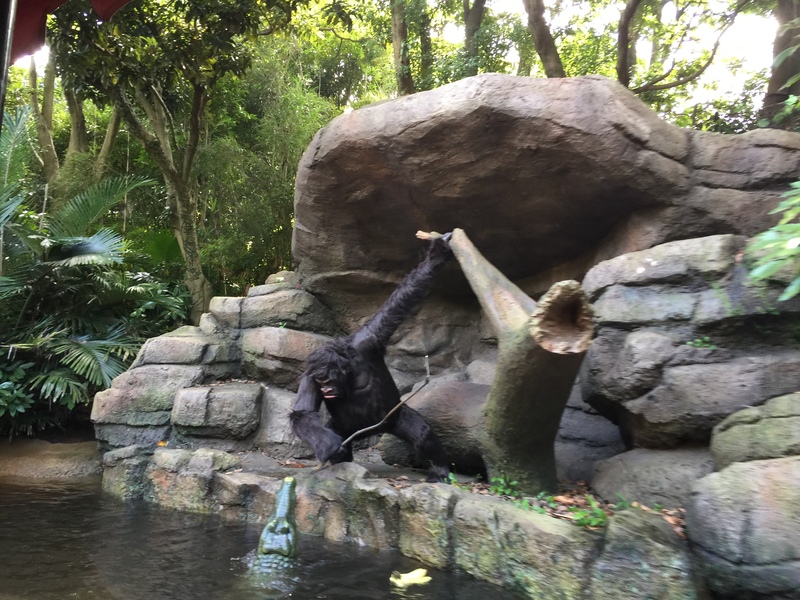 It’s not rethemed to Tarzan. I enjoyed the classic feel of this, and it had amazing views of the park. I’ve heard its pretty much the same, but it was closed for refurbishment during our trip so I didn’t get to ride it. 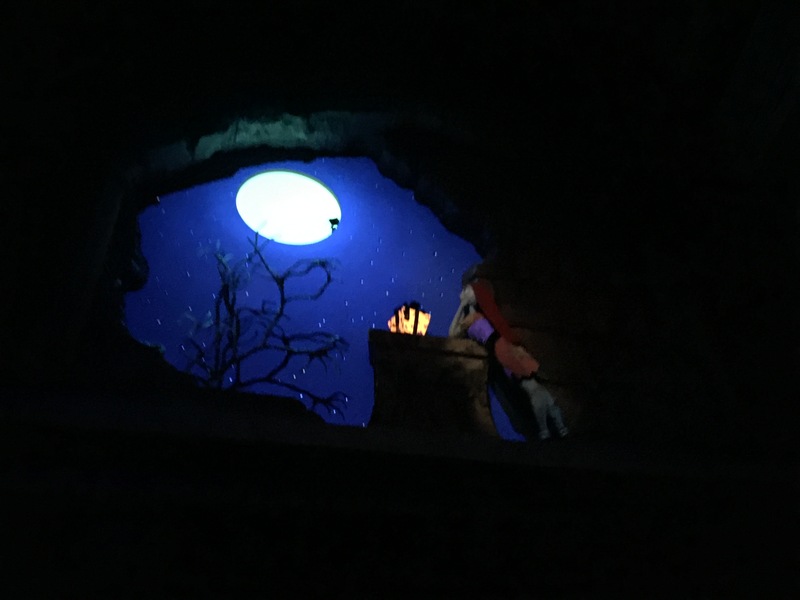 There are plenty of other rides (most of which are still clones) that we didn’t make time for, especially in Fantasyland like Peter Pan, Snow White, Alice, Dumbo, etc. 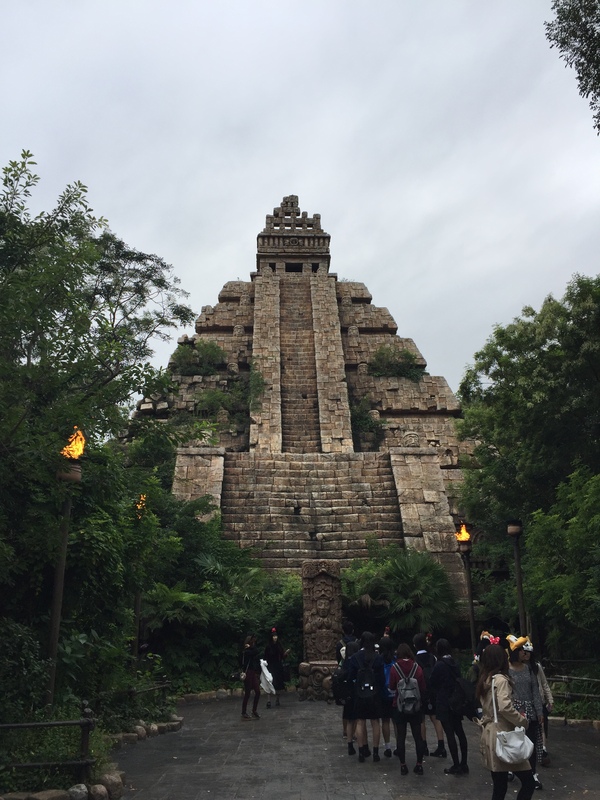 We also didn’t do Star Tours because I don’t like motion simulators (makes my tummy sad). 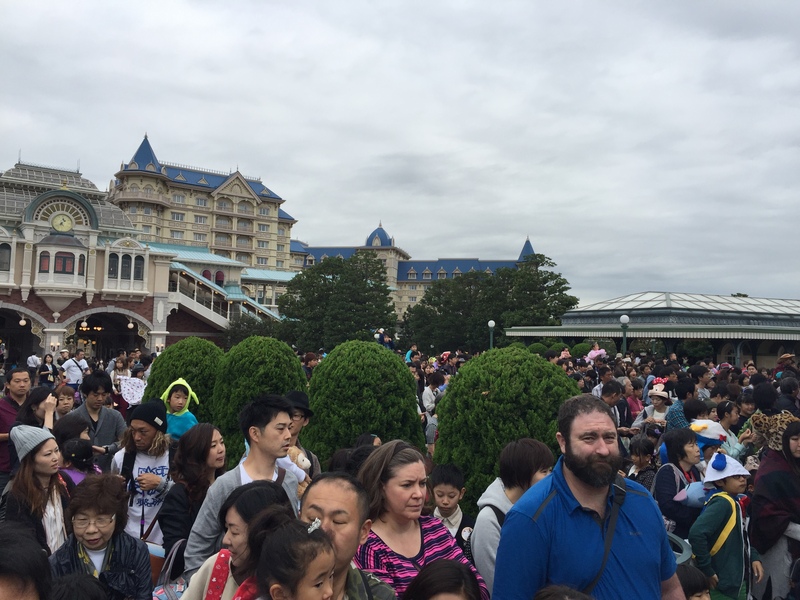 My overwhelming impression of the attractions here is that they have way more than Disney Sea, but they’re all basically clones of what we have in the US, and the unique attractions aren’t E-tickets (despite 120+ minute waits…). 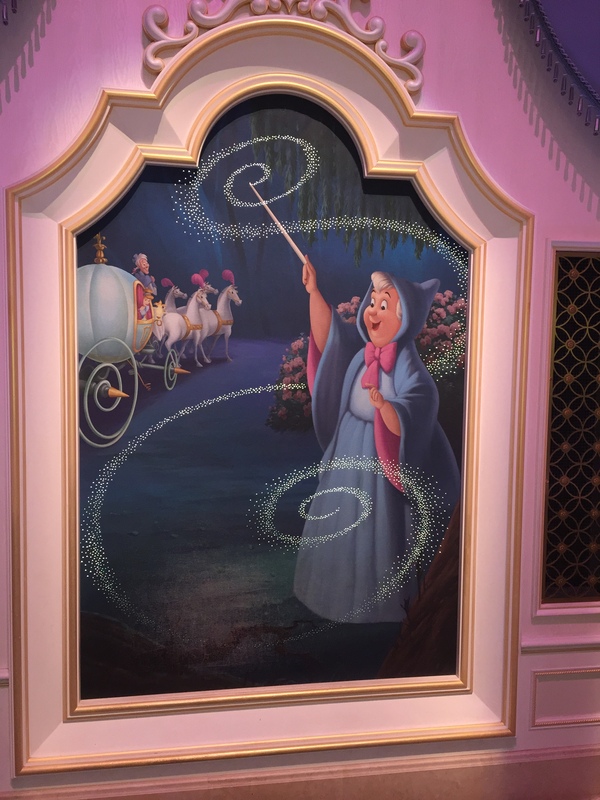 The good news is that with a little skill, you can work some magic with Fast Passes. This wasn’t on our list of things to do because its very similar to the US version. But, we were starving by lunch time one day and all the quick service places had long, long lines. I popped in here just to check and to my pleasant surprise they had no wait. Not only that, but we got a water-side seat! We don’t even get those in the US when we have a reservation! If you like the US version, you’ll like this version, too. One notable difference: no shooting stars on the ceiling. When we made this reservation I wanted to make sure my wife got a traditional Japanese meal setting. After two weeks in Japan prior, we’d had plenty of that, so by the time we got here we were kind of craving other options. I am not, however, going to hold that against the restaurant itself. 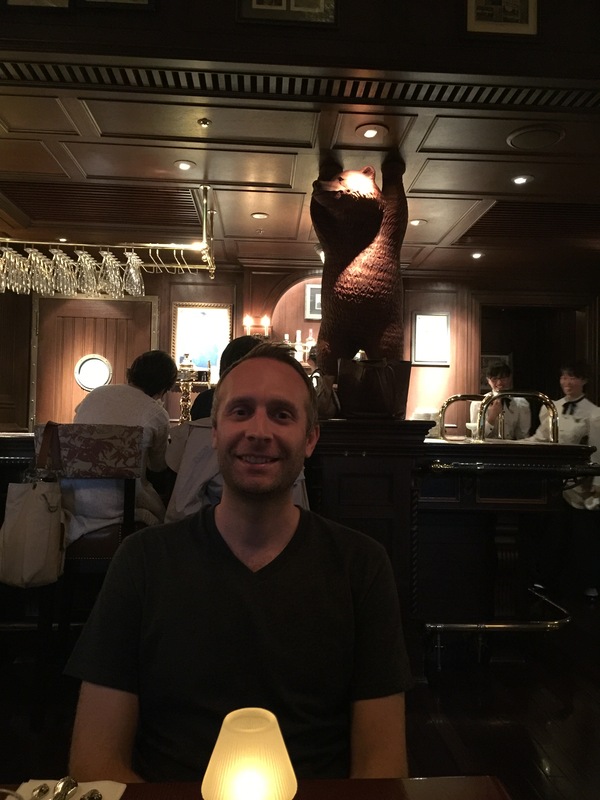 The theme was nice inside, food was good, service was friendly, but after two weeks in Japan we’d kind of “been there, done that”. 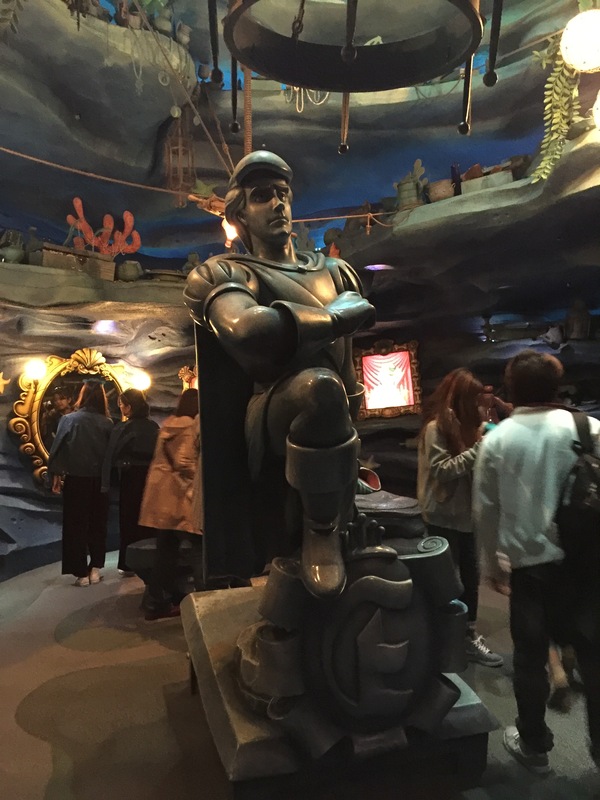 So, the attractions were mostly clones and table service wasn’t anything super unique (at least based on what we tried and saw)- what does Tokyo Disneyland excel at? 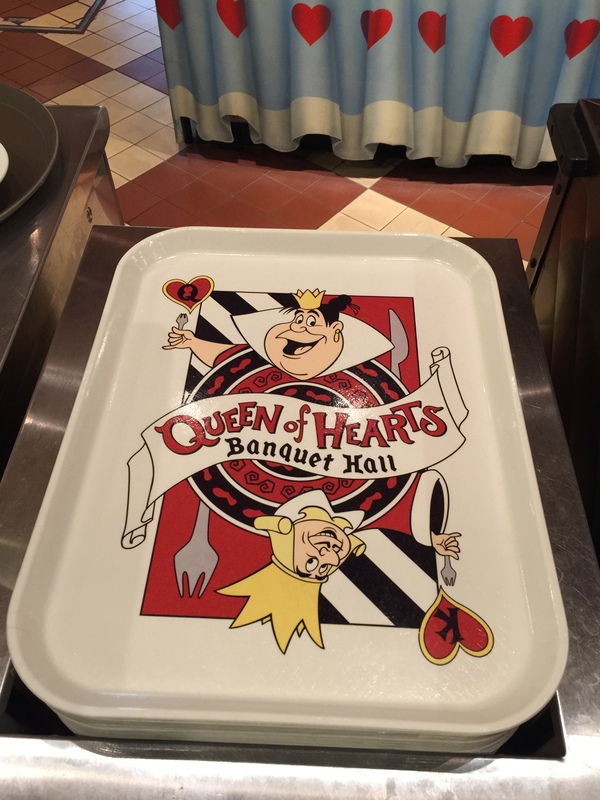 Quick service dining! 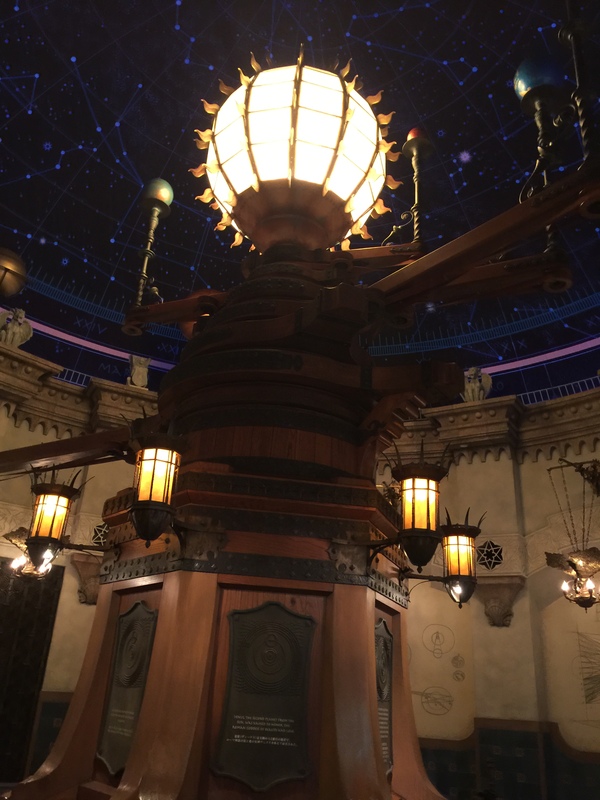 There weren’t many times in Tokyo Disneyland where I said “Man, we NEED this in the US” but this was one of those times. 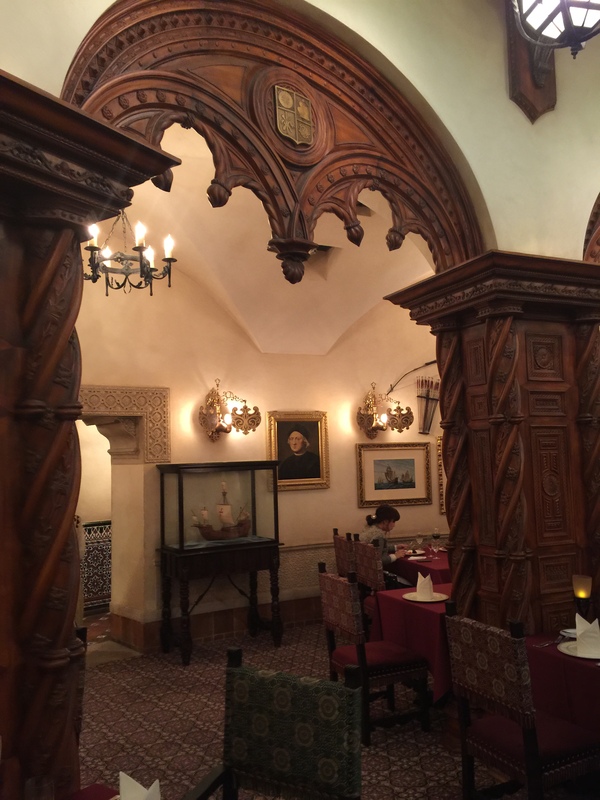 The theme here is incredible, and you really feel like you are dining in the Queen’s gardens. The food was tasty but not amazing, but definitely come here for the theme. 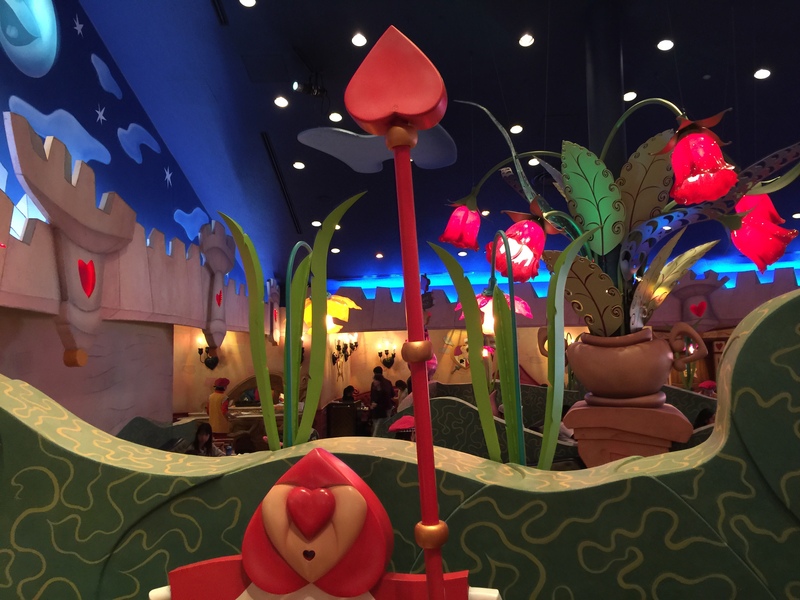 … and eat your snack in here, where you feel like you’re literally eating inside Splash Mountain. Nothing out of the ordinary here, except my burger came on a Mickey-shaped bun which was awesome. Otherwise, pretty similar to the US versions. Four for four on quick service places here! 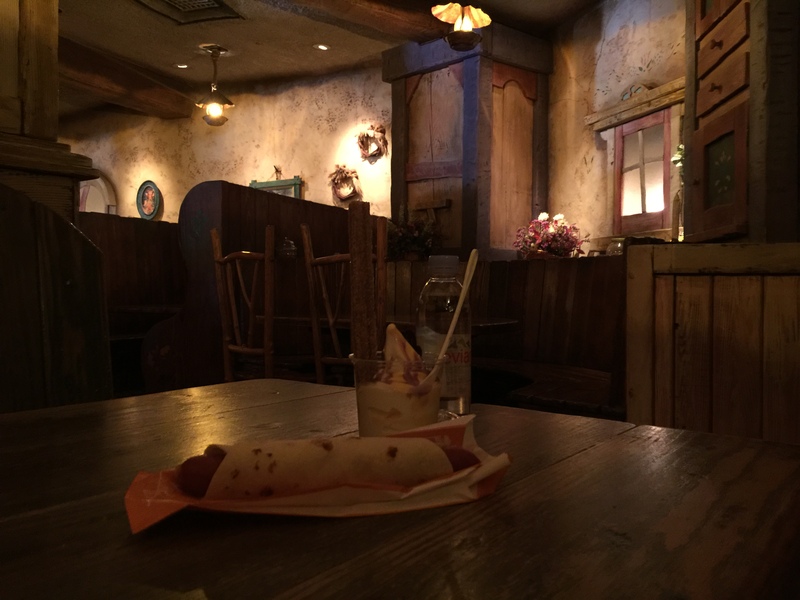 And, I also enjoyed the pizza spring roll (which you can buy at a cart in Toon town) and that was super tasty, also. 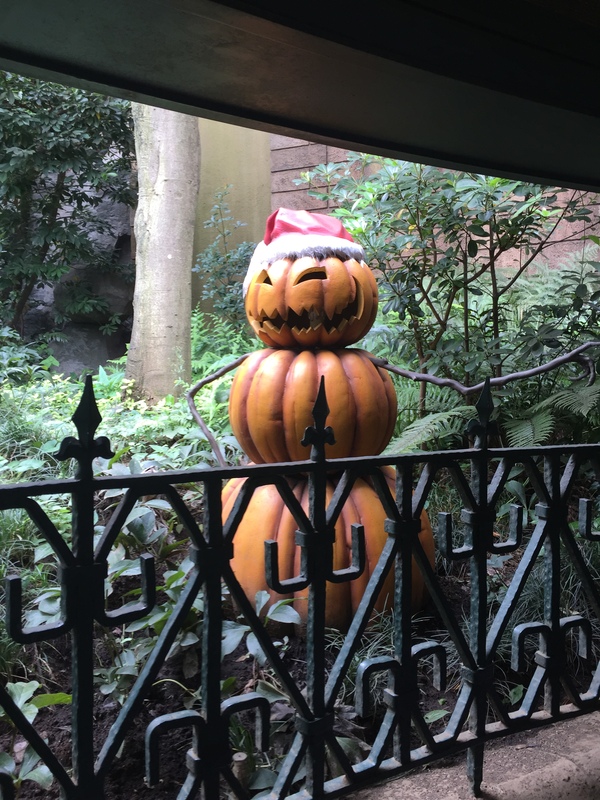 That about covers the food situation on the Disneyland side of things. By now you may have noticed two things which I haven’t talked about much: the shows and the swag. 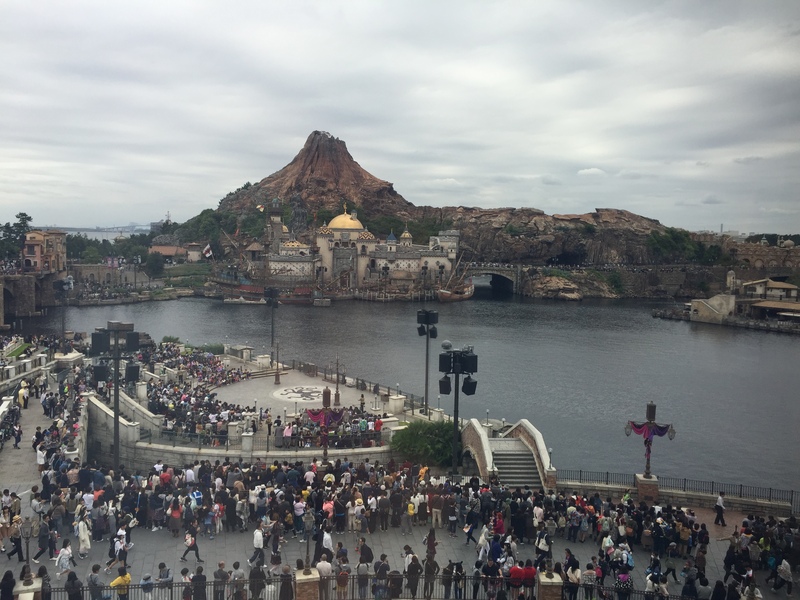 For shows, we only watched what we could see from our room’s window at Disney Sea, which includes Fantasmic and another show. 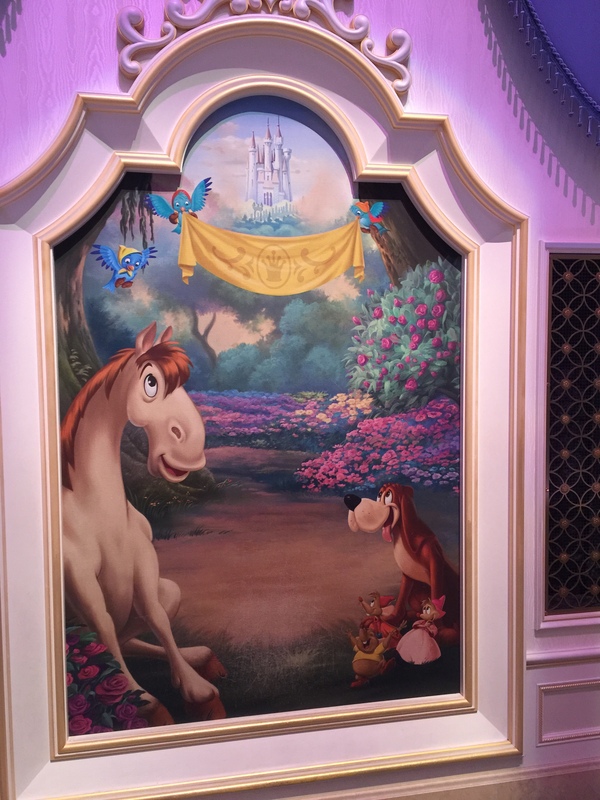 Both were very entertaining, but in general we’re just not into the shows much in terms of our Disney priorities. 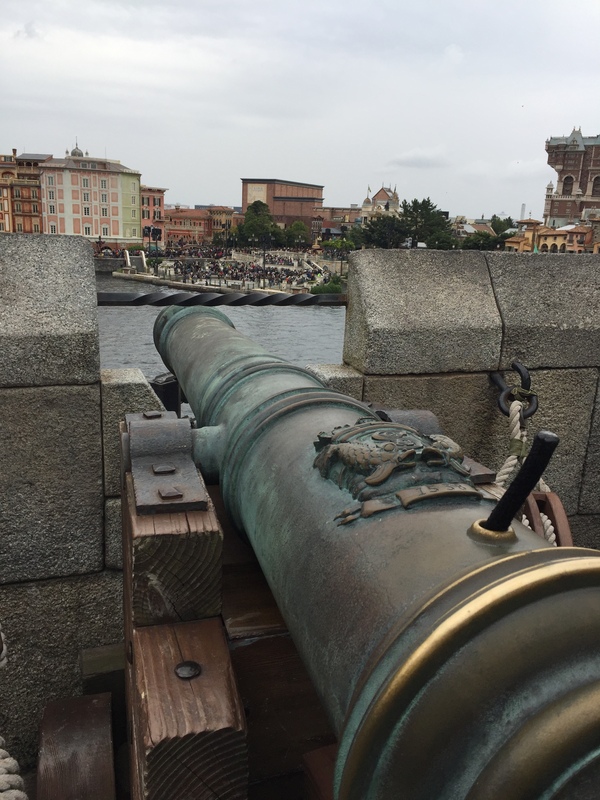 We caught glimpses of parades at Tokyo Disneyland and they seemed great, but, again, we weren’t focused on them. 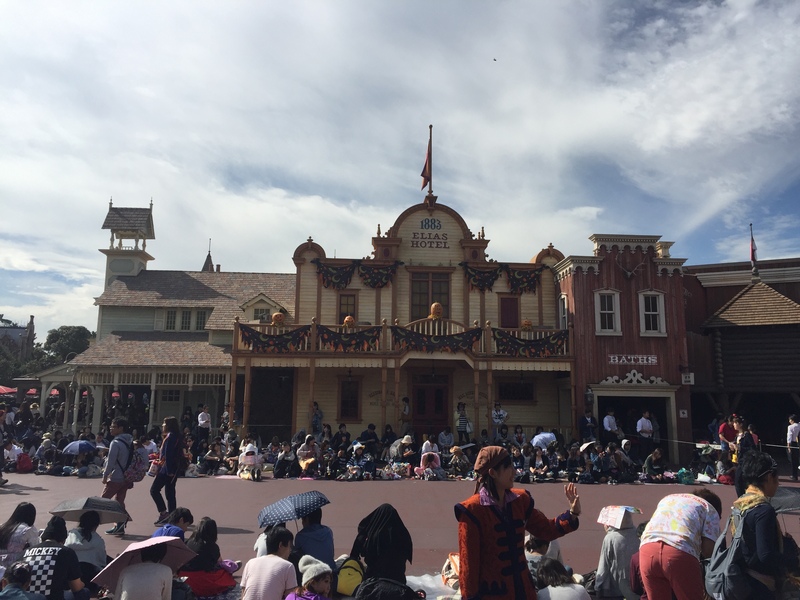 What astonishes me is that people will camp out in the middle of the walk ways 1-2 hours before a parade begins. It’s actually a bit of a head ache to navigate around people sitting down like that, especially if you happen to be distracted or something. All in all, I am clearly an outlier here because most people rave about the unique swag here, but I’m not feeling it. To each their own, I suppose. 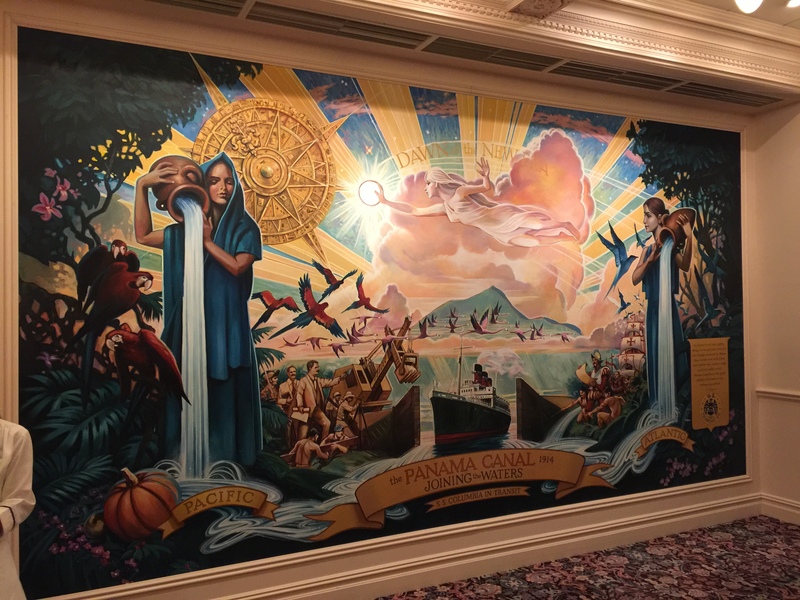 In addition to enjoying the parks and our hotel, we also stopped in the other two hotels on site just to look and they were both beautiful, too. 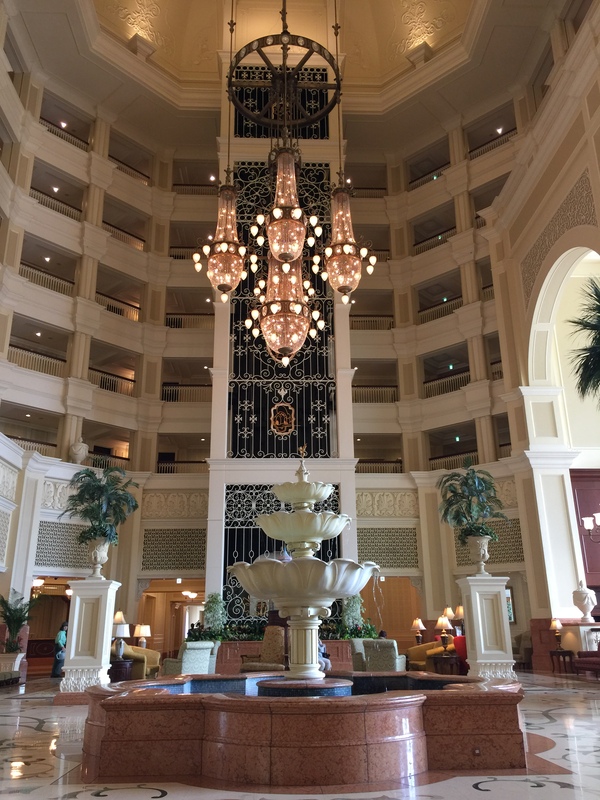 Tokyo Disneyland Hotel is a very elegant design, seems very European and classy. 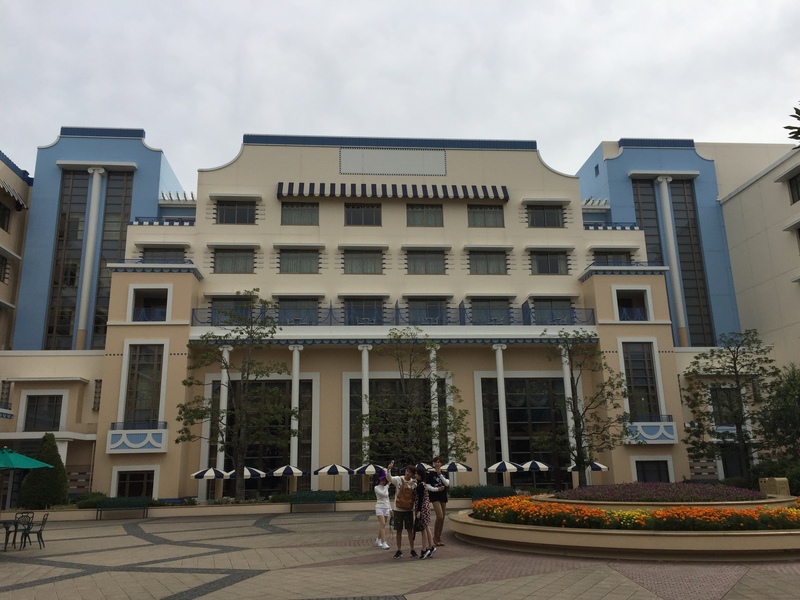 The Ambassador Hotel has a more “early Hollywood” feel, and was also very clean and very nice, and is the most reasonably priced on-site Disney hotel. As for their Downtown Disney, it’s similar to CA in the sense that it’s shops that have no real affiliation to Disney and a Rainforest Café. 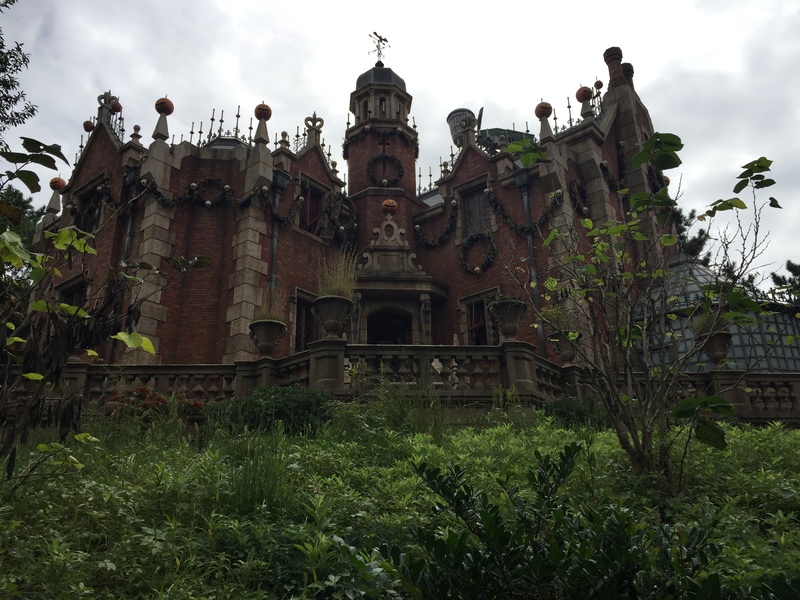 A good way to get out of the Disney bubble for a bit if you need to, but we didn’t find anything overly special here. 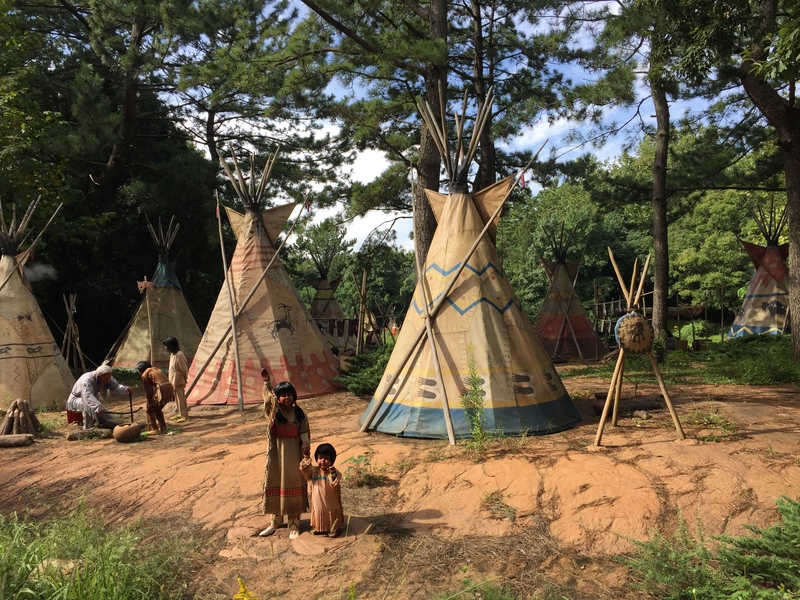 Amazing, unique experience with lands that are diverse and immersive. Service is exceptionally friendly and willing to help. 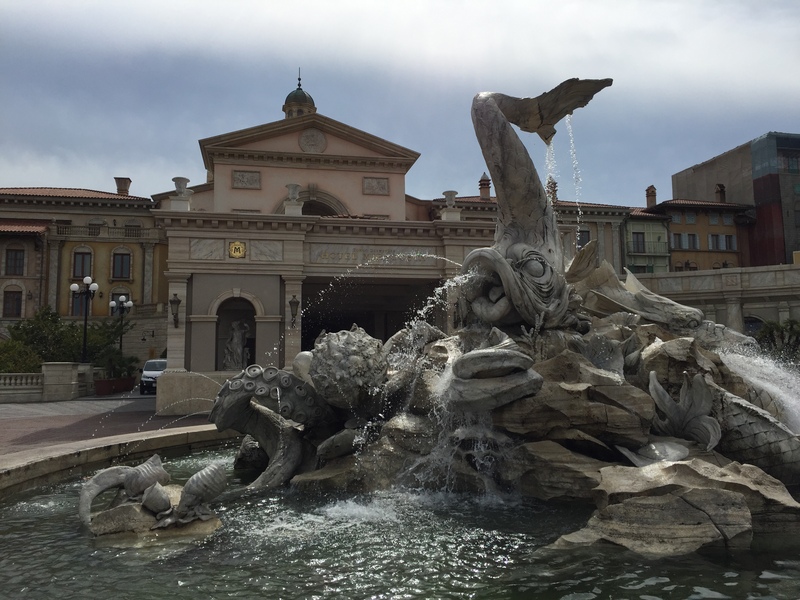 On-site hotels are not cheap, but I’d recommend considering it a once-in-a-lifetime kind of splurge. Extra 15, where you get into the park 15 minutes early, is not that helpful. They’d really benefit from a full extra hour here. Not all staff speak good English, so sometimes you can’t get your questions answered (or at least not quickly or clearly). This isn’t a knock on them as it’s their country but just putting this out there so people know. 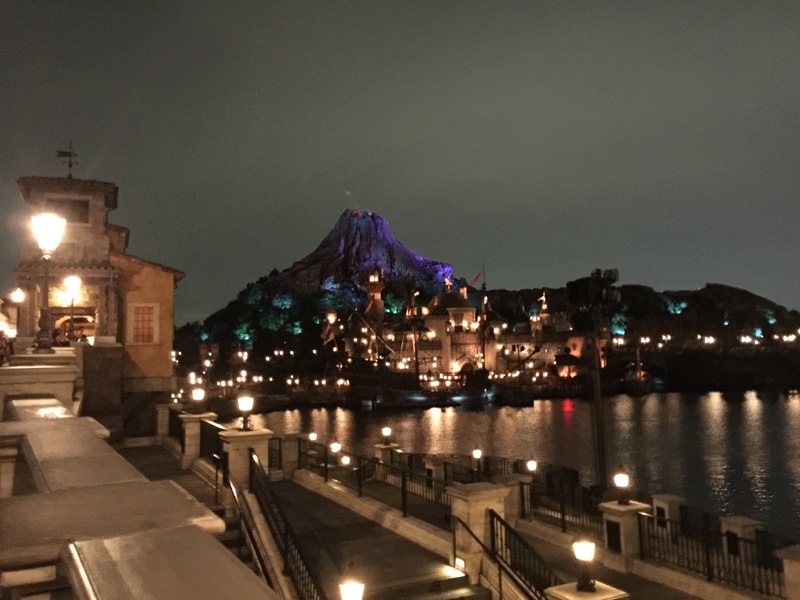 If you have specific questions about Tokyo Disney, please feel free to comment and I’ll do my best to answer!